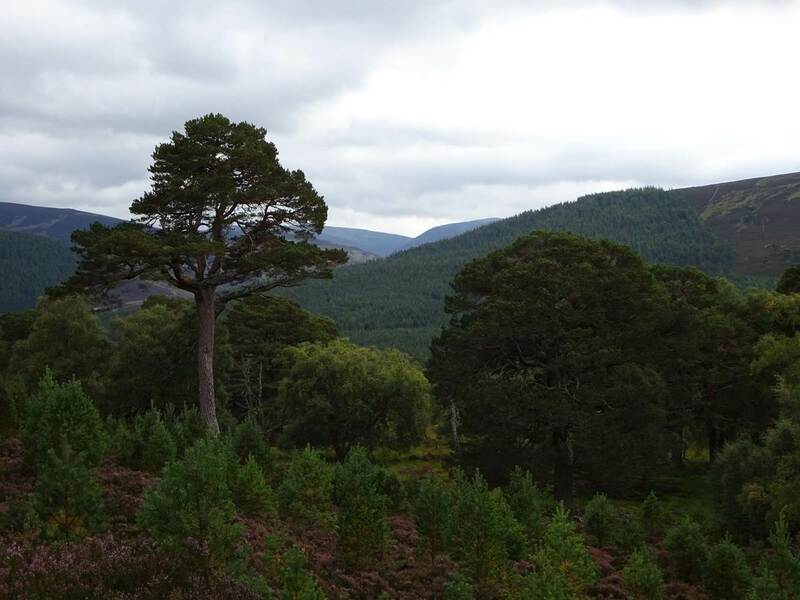 So, I'd decided I wanted to see Braemar Castle. 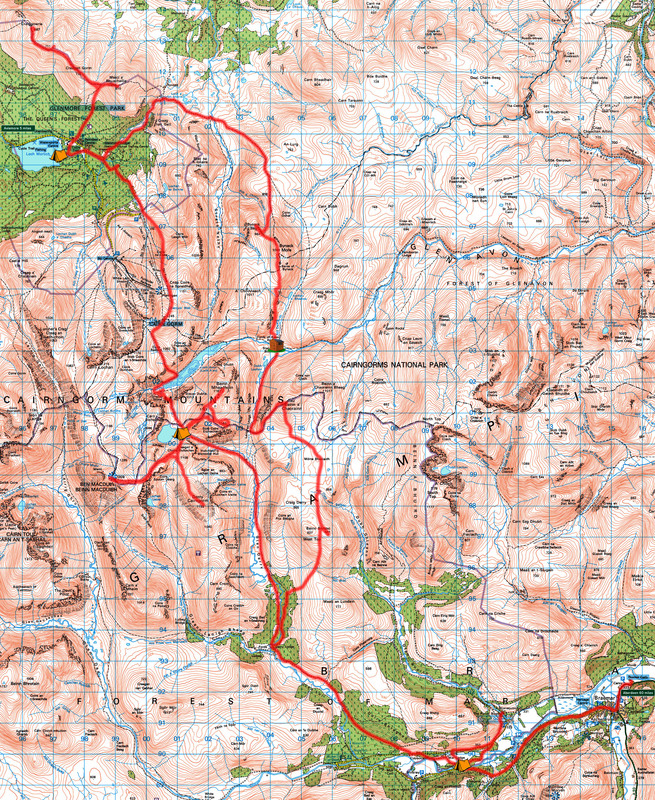 The Cally Sleeper would take me to Aviemore, bus to Glenmore and Shanks's pony down to the castle and back. 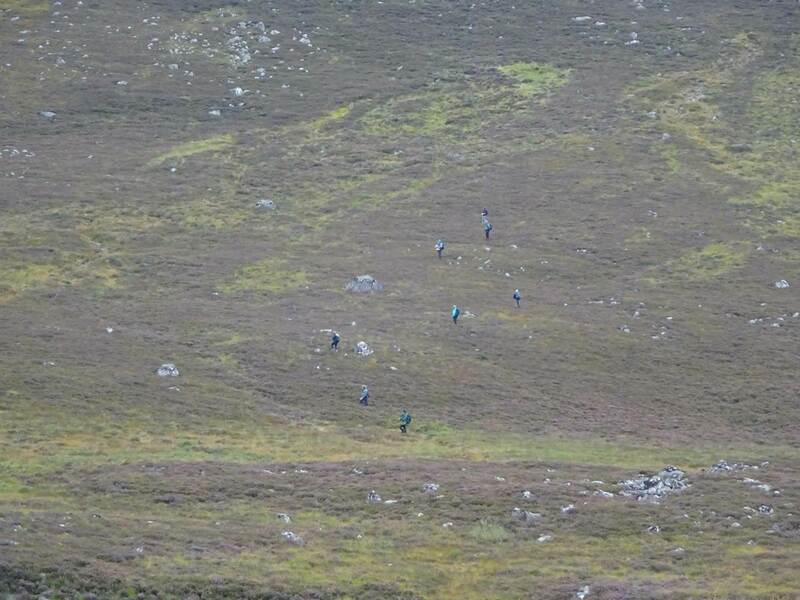 Seems there's a few Munros on the way too and seven of them were right in my way. Day 1. 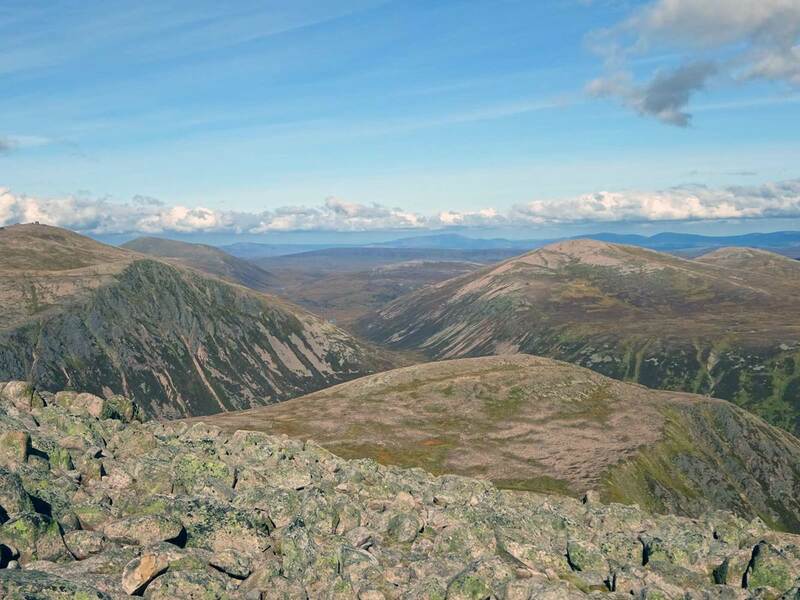 Glenmore to Loch Etchachan (via Cairn Gorm). 9½ miles, 4475ft ascent. I got to Glenmore at around 8.30am and leaving the hectic (another car came!) main road set off into the forest - The Queen's Forest no less! 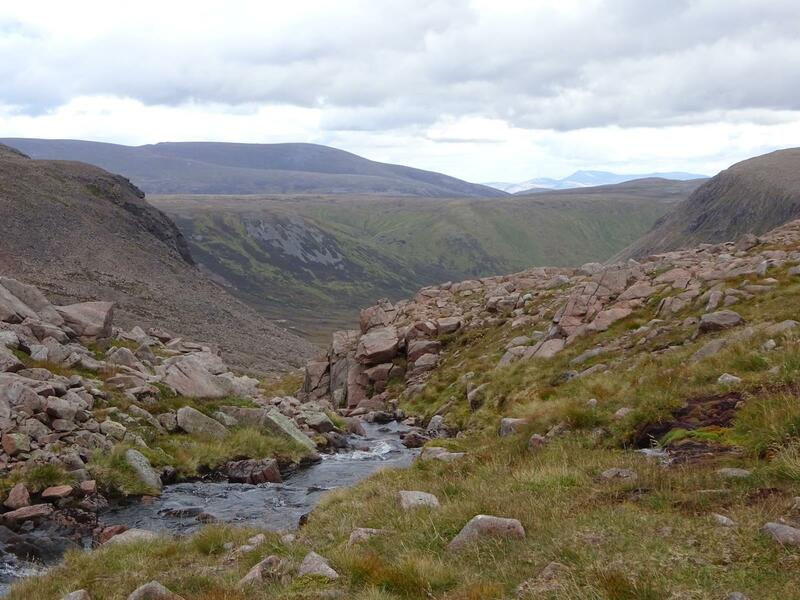 - heading towards Cairn Gorm (via the Coire na Ciste route) over the Abhainn Ruigh-eunachan. HM's forest was nice at first, cool and fresh and the paths were clear. 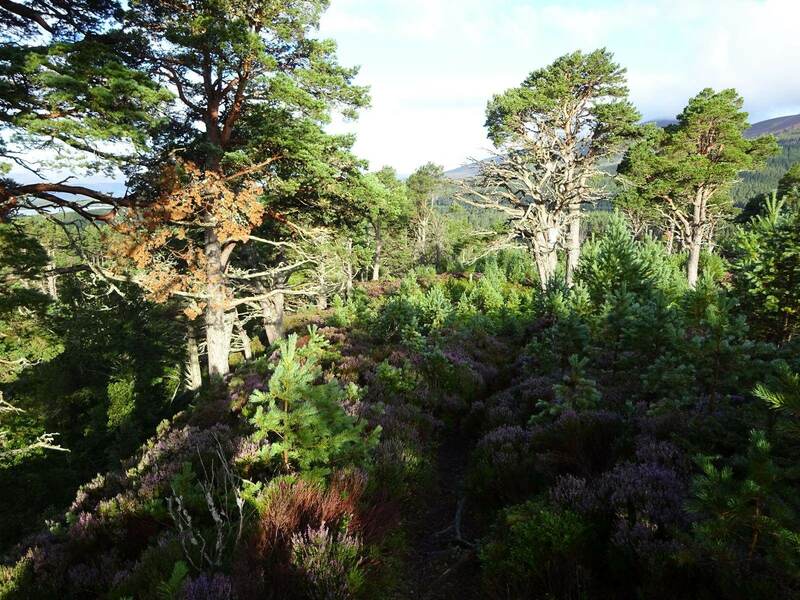 But after a little while the path had gone and I ended wandering way off and had to compass-correct myself with a tough ascent up a steep banking using ferns and tree roots as grips. Up and over at the top and back on some sort of a semblance of a path, although the thick heather and tall ferns would suggest it wasn't used much. It was all so dripping wet with dew that the waterproofs had to come out despite it being bright and sunny. The ground was uneven and rising, it was hot and damp and a boring start to the day. Pretty though. Eventually I was out of the woods, figuratively and literally and finally heading up what looked like a proper mountain. 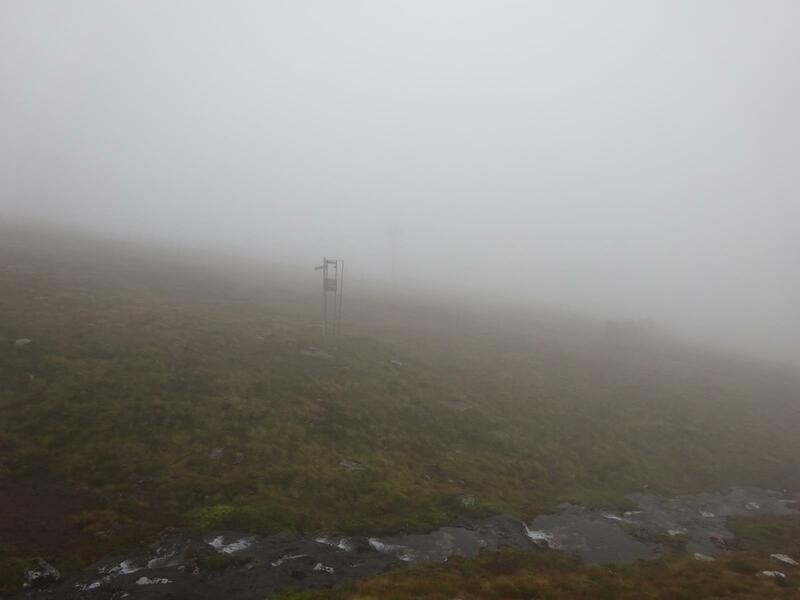 Although the weather was looking good behind us, ahead of us there was a slight hint of mist. 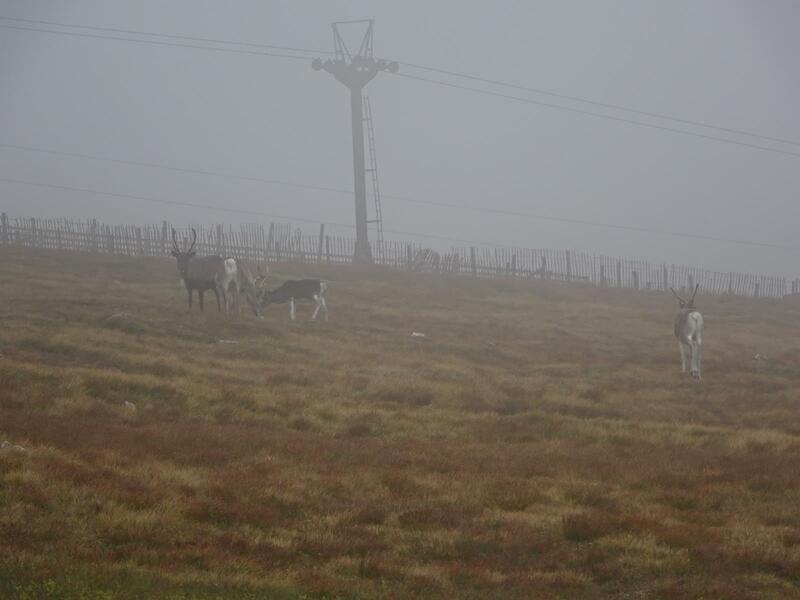 Reindeer, feeding up before their hectic Christmas schedule. And a digger! A chat to the driver's mate quickly turned to midges as conversation often does round here. And an emergency stop button hovering a good 10 or 12ft up in the air. 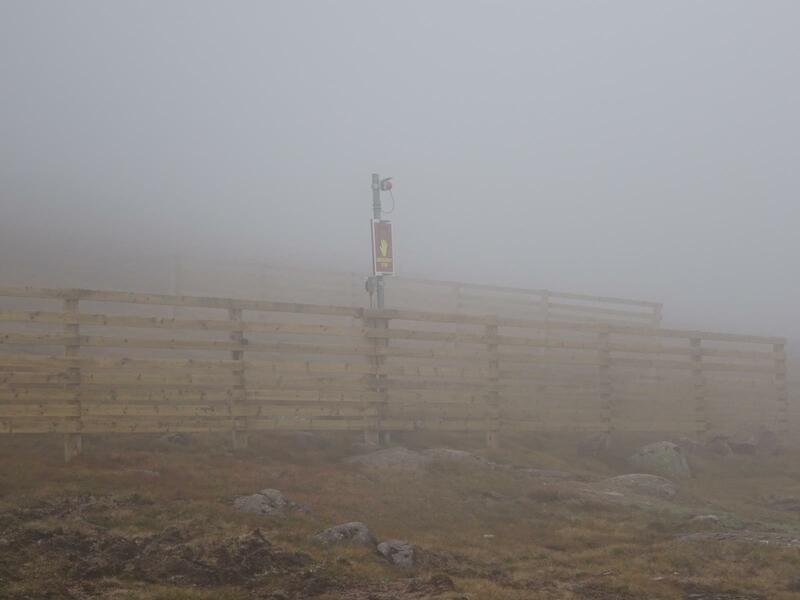 The winter snow here must easily cover the wooden fencing when it's skiing season. Impressive. 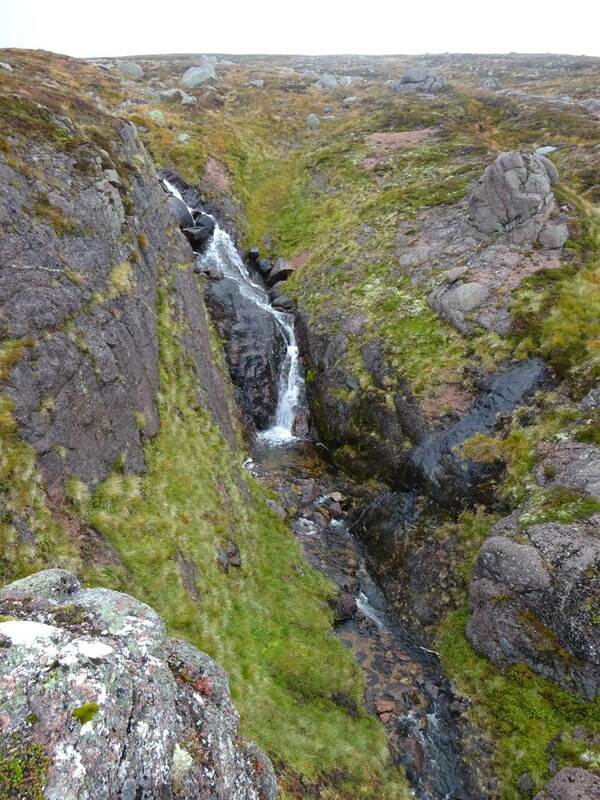 This is, I think, the Marquis's Well at around 4,000ft the highest spring in Britain. I'm not too sure though, there was a damp patch a bit further but this one looked more the sort of thing a Marquis of Huntly would go for. Not far to the top now! 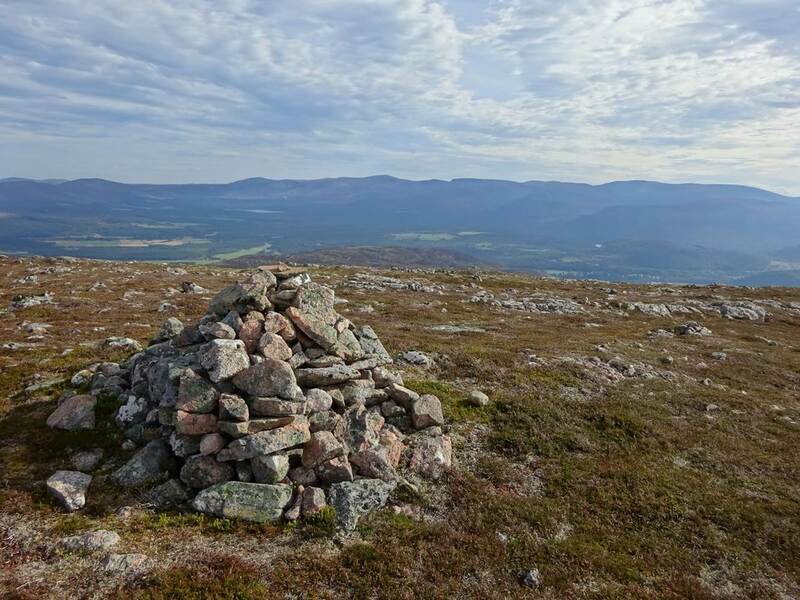 Funny how one's pace is quickened by the sight of a cairn! 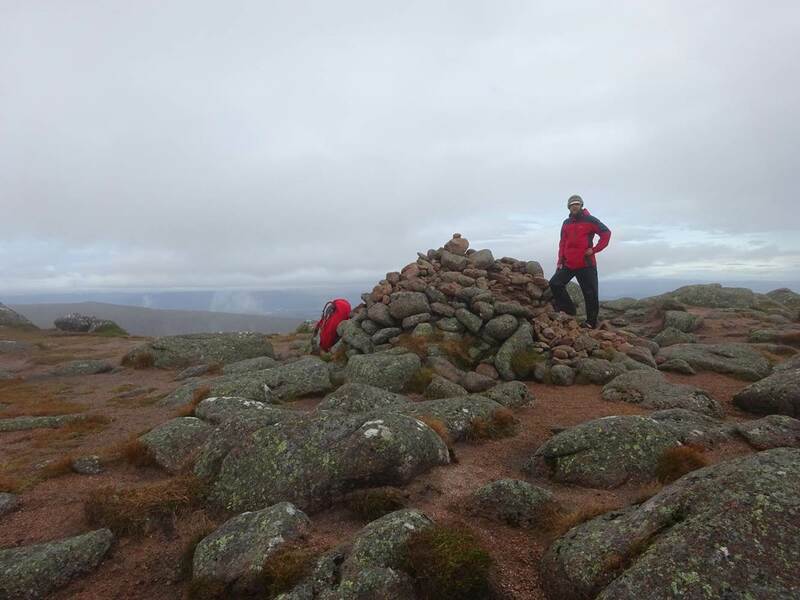 The cairn of Cairn Gorm was reached. Phew! It was very windy here, and what I thought was a shelter must have been just for the University of Edinburgh's meteorologists. So I settled down for a chilli-egg sandwich in the lee of the weather station, and was somewhat startled when it began to whirr and open up to take a reading! 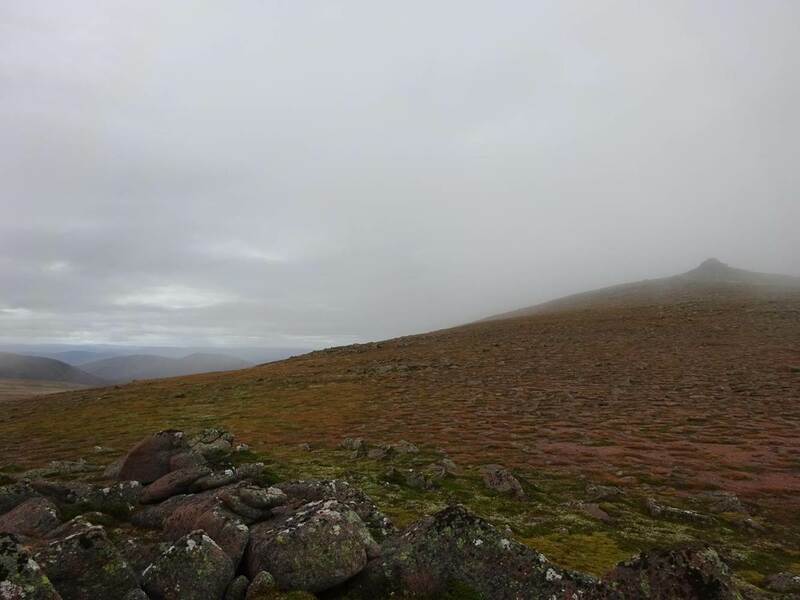 As I got towards the far side of the lunar-like rocky summit plateau of Cairn Gorm I could hear the weather station closing up again for another 26 minutes, and the view ahead of me looked a lot more appealing. What wasn't so enticing was the view of someone's carefully bagged up litter just below the top. The odd crisp packet whisked away from a careless hand by an eager wind I can understand, but just leaving crap like this knowing that the park rangers will clear it up at some point is a tad grating. 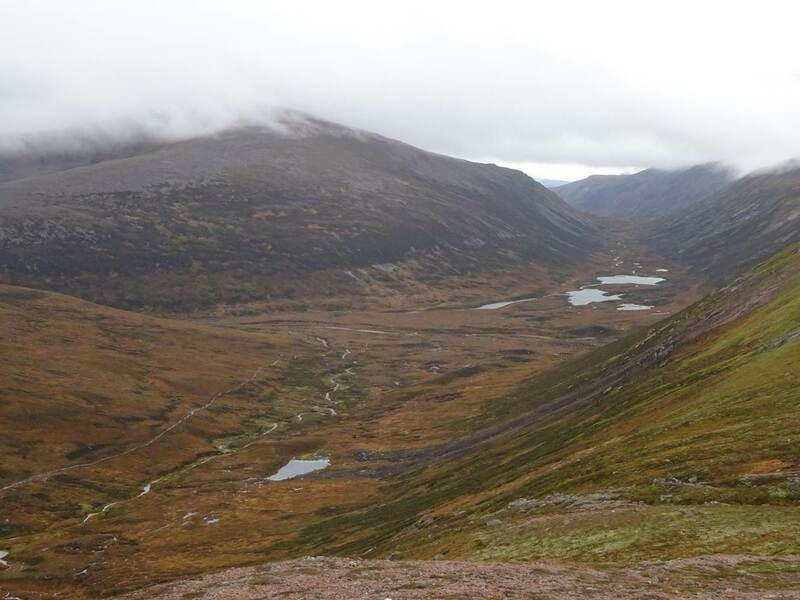 Luckily my gaze was distracted by Loch Avon (Loch A'an to the locals I was later told) in the near distance. 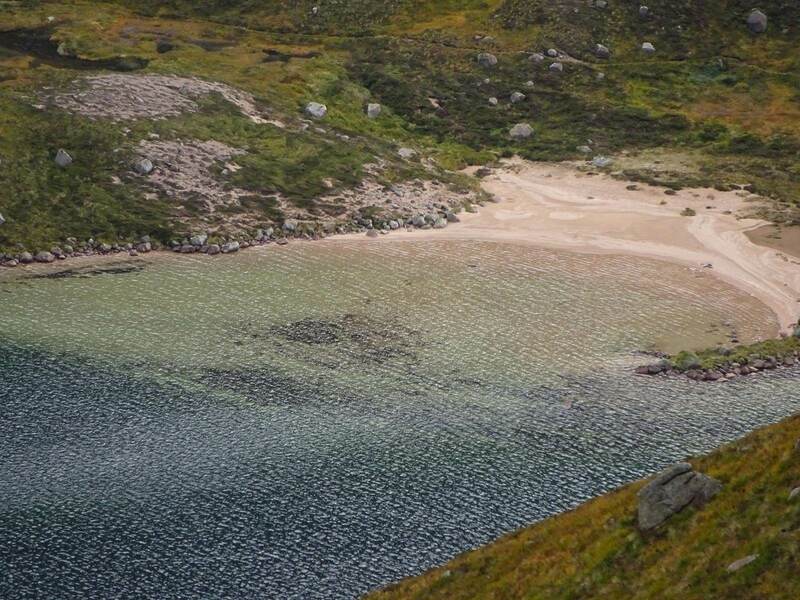 The beaches of Loch Avon looked very enticing, but a long way down. 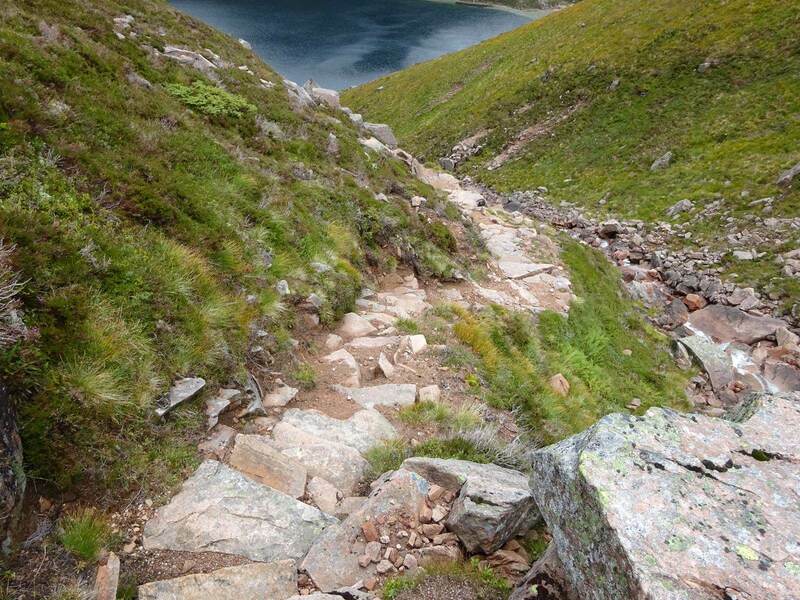 The descent down the very well-constructed granite steps of Coire Raibeirt was torturous! Both on the knees but also that every now and then has I cautiously and unavoidingly took a large step down by pack would catch on the step behind me and so nearly send me hurtling forwards - downwards, to end up in a Sea-King no doubt. Thankfully I made it all the way down to lochside without major incident, and swung to the west to head round the beach-end of it intending to go via the Shelter Stone. 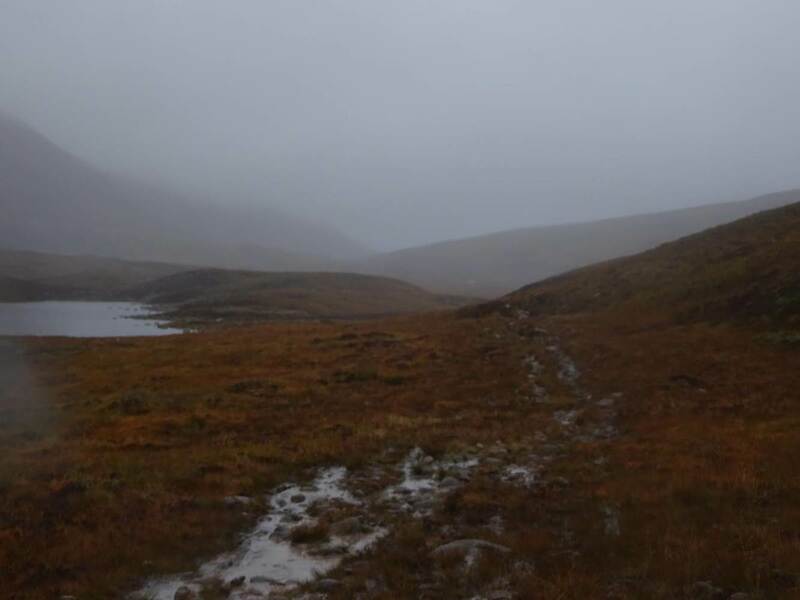 But bizarrely it took me so long to navigate the drops and bogs and streams and dead-end paths at the top of loch that when I got near the Shelter Stone I just couldn't be bothered actually going towards for a look. 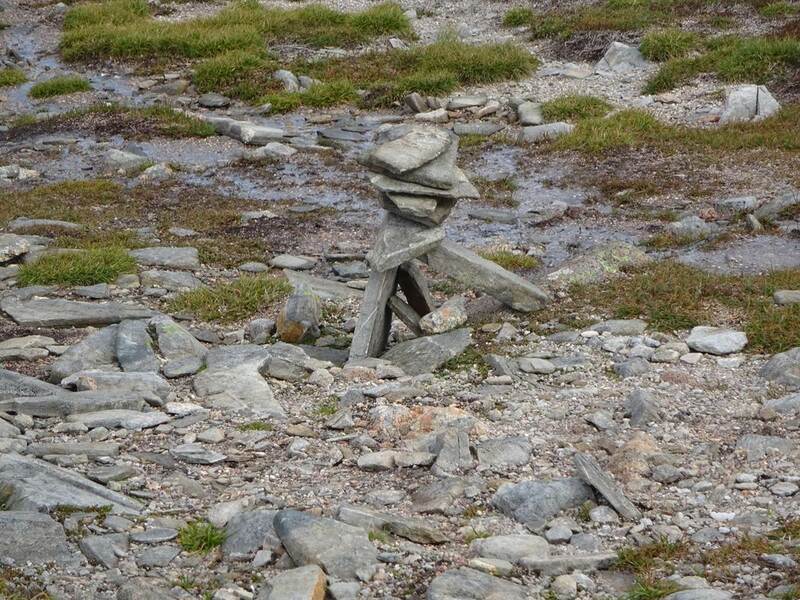 I like the cairn on top though - good effort someone! As I got higher I took one final look back at Loch Avon, and saw my first Ptarmigan of the day. 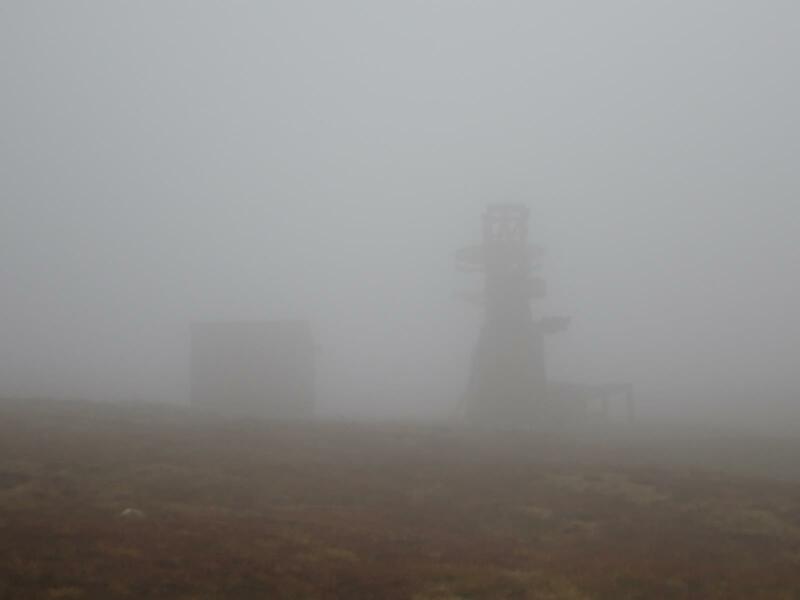 I'd managed to walk obliviously past the Ptarmigan restaurant on the top of Cairn Gorm with it right under my nose because of the mist! Not that I really minded though. The feathered kind was much nicer and much more in-keeping with the surroundings that some tourist cafe. 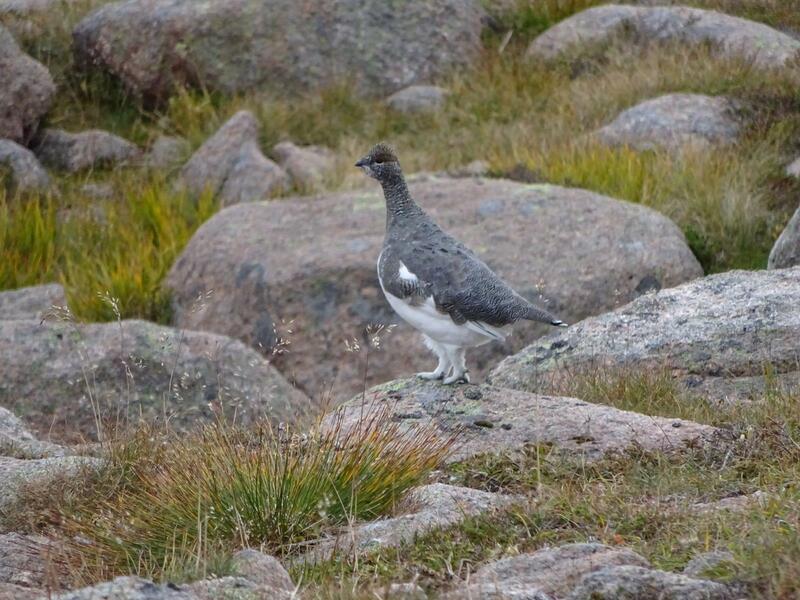 Mind you, I was soon to get very fed up of ptarmigan - they're worse than grouse for suddenly and noisily appearing out of the undergrowth while you're rambling on peacefully miles away in a world of your own, croaking and squawking like some angry strangulated terrier puppy. Bloody things. I like their trousers though. 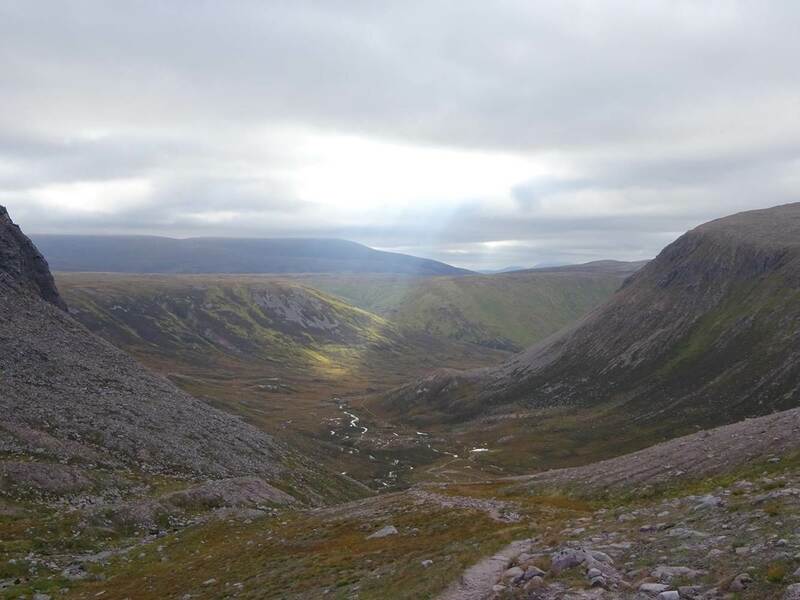 Once at the top of the Allt nan Stacan Dubha I had one last look back, I think - I can't remember which way that photo is looking now, and headed down to Loch Etchachan - my campsite for the next two nights. Unfortunately when I got down there hoping for hermit-esque solitude I was aghast to see someone had beaten me to it, and not only that but he seemed to have bagged the only dry spot in the marshy loch-periphery. By the time I'd found a spot and settled, and pitched up it was getting dark so for some reason I didn't take a photo of my first evening's camping. But what I did take a photo of was some more rubbish. 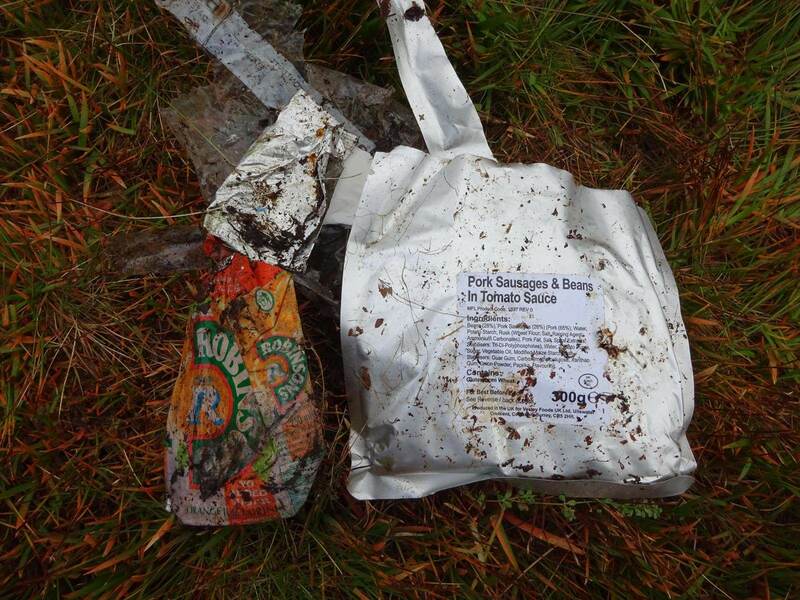 Working on a small pit to use for nature's callings behind a large boulder about 20yards away from my tent I uncovered a drink carton and a foil packet of sausage and beans. Judging from the date on the foil they'd been there at least 2½ years and obviously were not far into their decomposition process. Turns out army cadets are the likely suspects. Despite the star-light alone brightening my tent, sleeping was not a problem. Day 2. 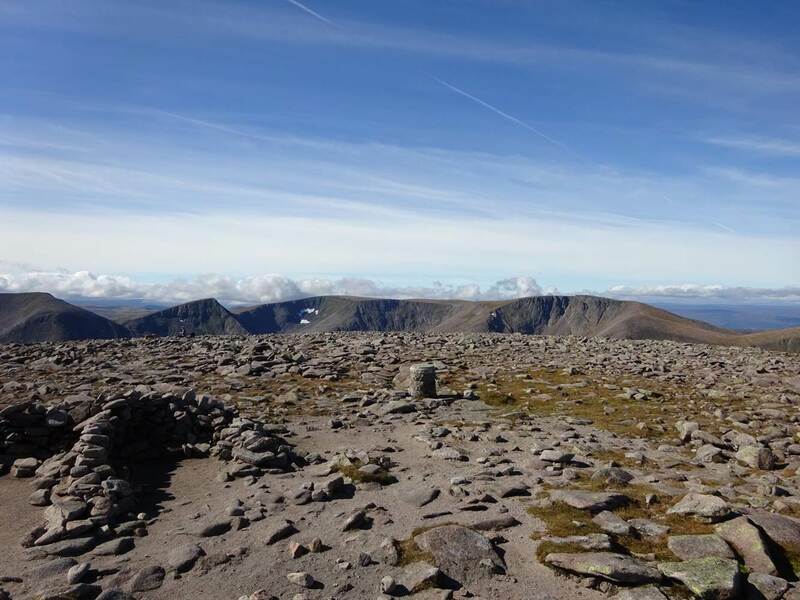 Beinn Mheadhoin, Ben Macdui and Derry Cairngorm. 11 miles, 3547ft ascent. The next morning the skies were still clear and the first thing I noticed was how much nicer it would have been on the top of Cairn Gorm today! I'd finished breakfast and been to my own little shelter stone (ie. 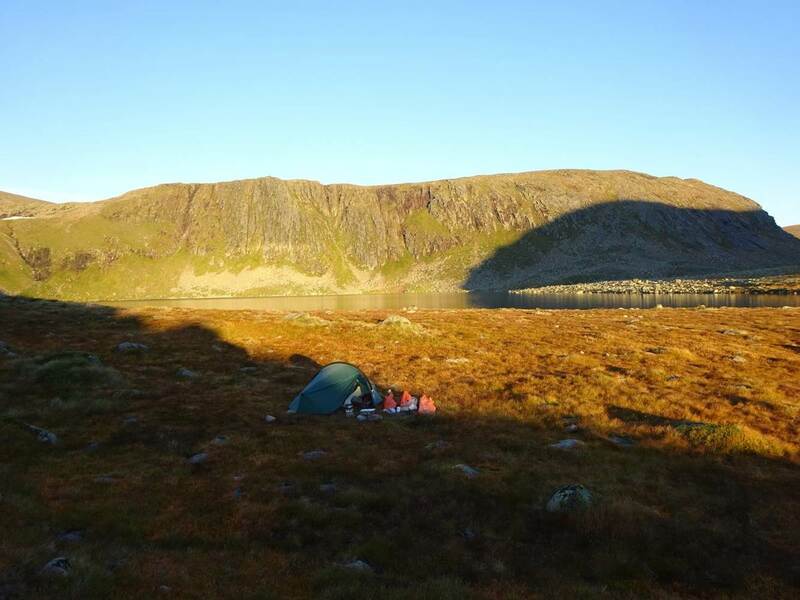 loo) by the time the sun was warming my tent. 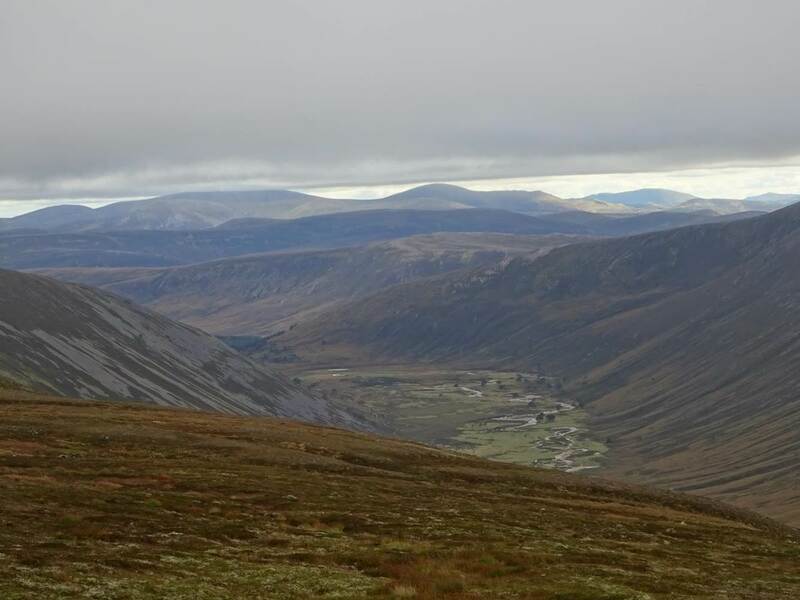 My plan today was to head up Beinn Mheadhoin and then dip down the Lairig an Laoigh to head up Beinn a'Chaorainn. Didn't look too bad on the map, and I might even have time for some afters somewhere too. On the way up Stob Coire Etchachan I got my first good view of my campsite. 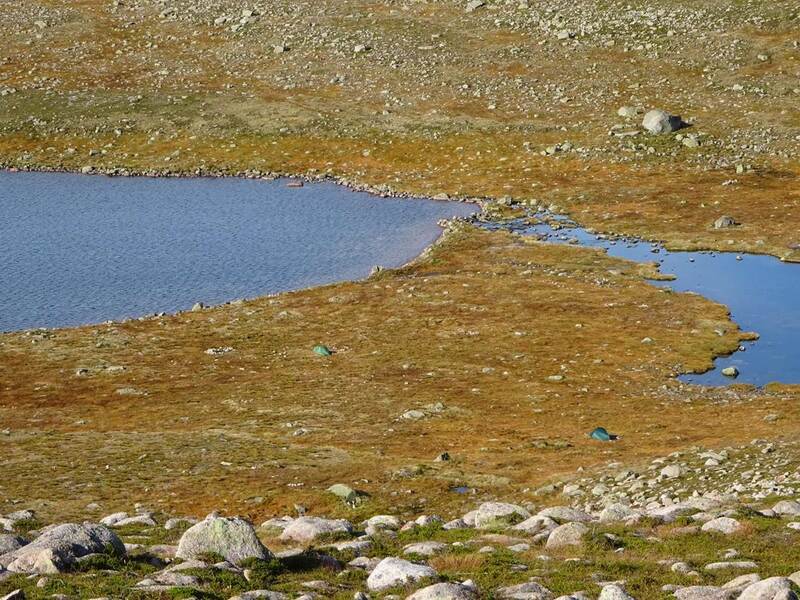 My tent is just above about half-way along the smaller loch. 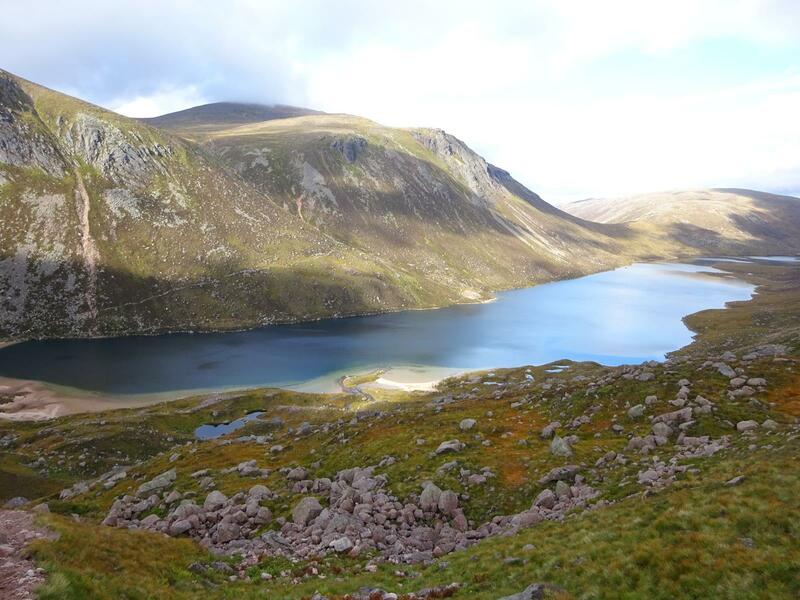 After a short but steep climb up the views were grand, loch Avon and the Barns of Beinn Mheadhoin above. The walk over the plateau towards the barns was very pleasant indeed, clear firm ground and clear blue skies. A summit-seflie, and behind yours-truly a fine panorama. The low-lying mist is above the Aberneth Forst / Nethy Bridge I think. 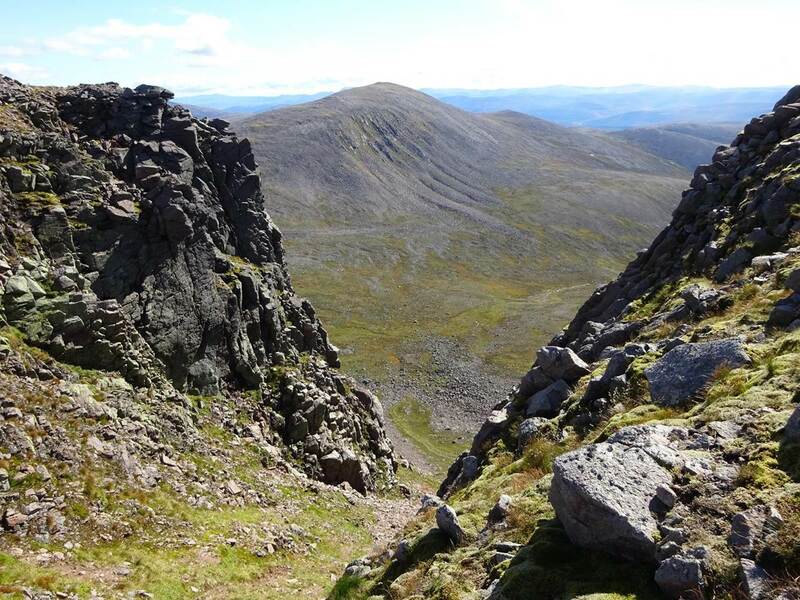 Heading briskly over towards Beinn a'Chaorainn via the cairned peak above Stob Coire Etchachan. Once up at the top of said little peak I had a better view of where I was going and it didn't look too promising. I couldn't see any path, which isn't the end of the world the drop down the Lairig an Laoigh did look like the end of the world and I couldn't see a way up the other side either. 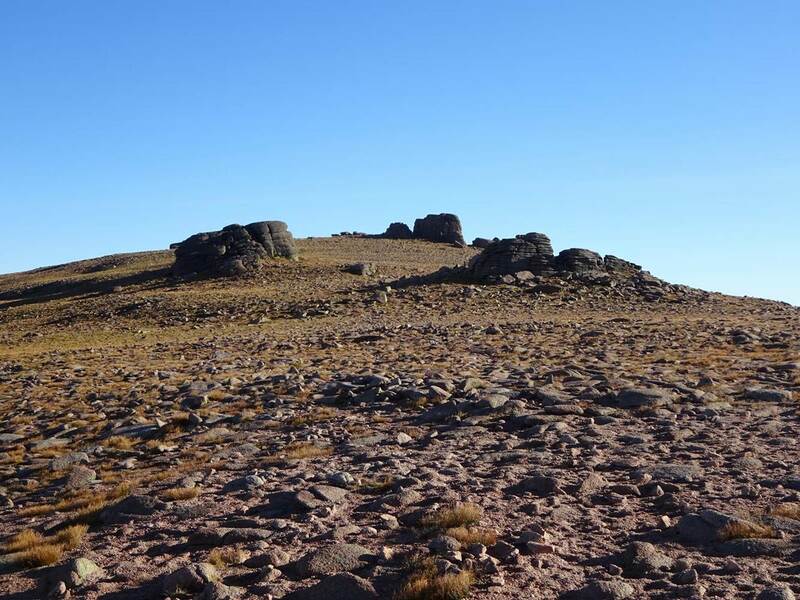 Also pretty much the way as far as I could see was a boulder field and not easy to get across. 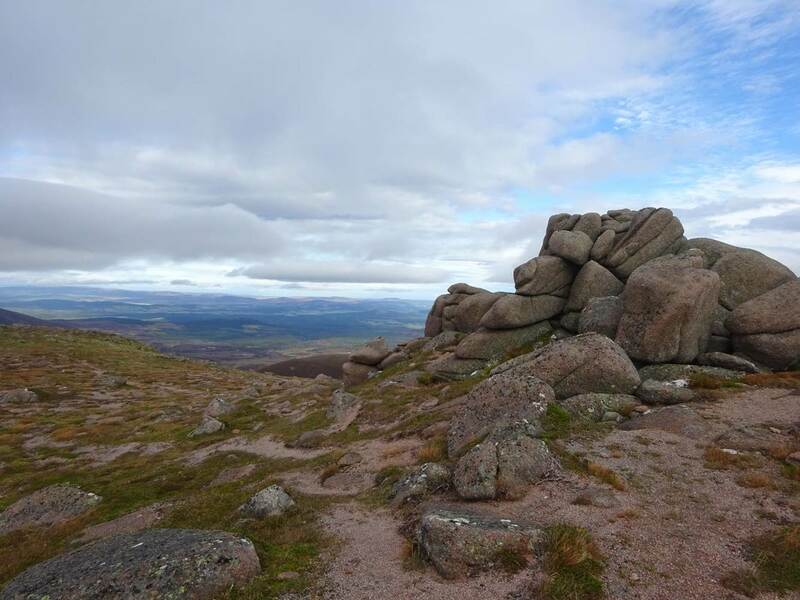 So I could've got to the top of the drop, not see any way down and then have to retrace my steps all the way back across the boulders which wouldn't have been fun and could taken a good hour or two. 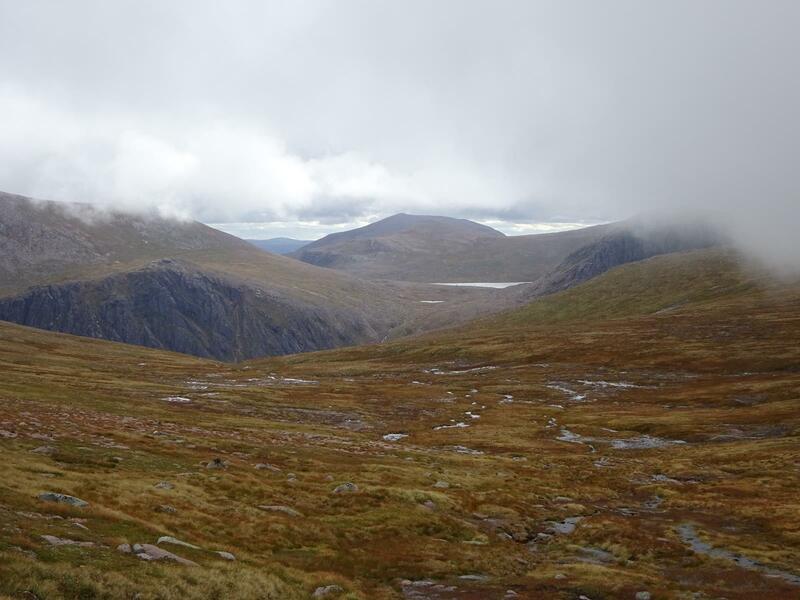 So with plenty of other hills dotted around and Beinn a'Chaorainn going nowhere I headed back from here. The view down Glen Derry from the top of Stob Coire Etchachan. 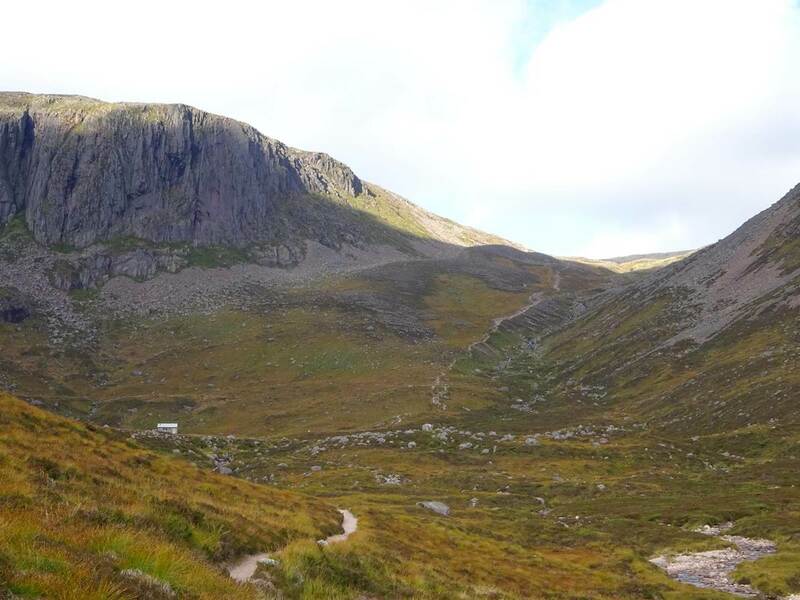 The Hutchinson hut clearly visible in the sunshine. 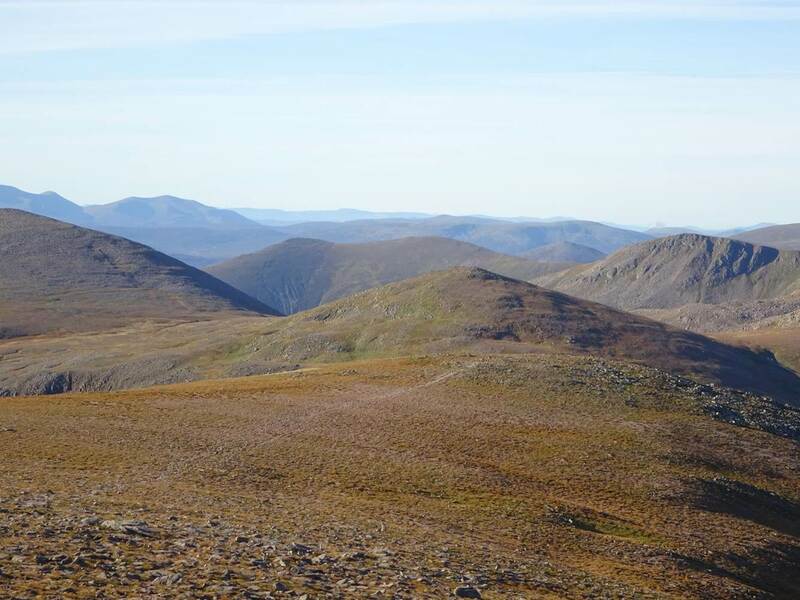 With plenty of time left today getting Ben Macdui and Derry Cairngorm out of the way would make the walk - with pack - down to Braemar much easier tomorrow. On the way up I paused for a breather by this gap above Coire Sputan Dearg, two young men also paused on their way down. Without saying hello they started moaning about the view! "Not much down there, is there? 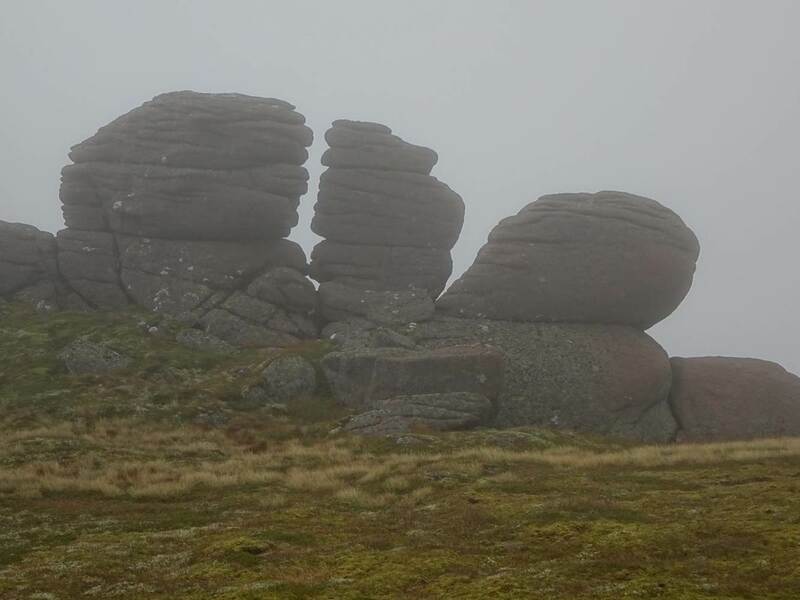 ", "Nah, couple of crags but that's it. 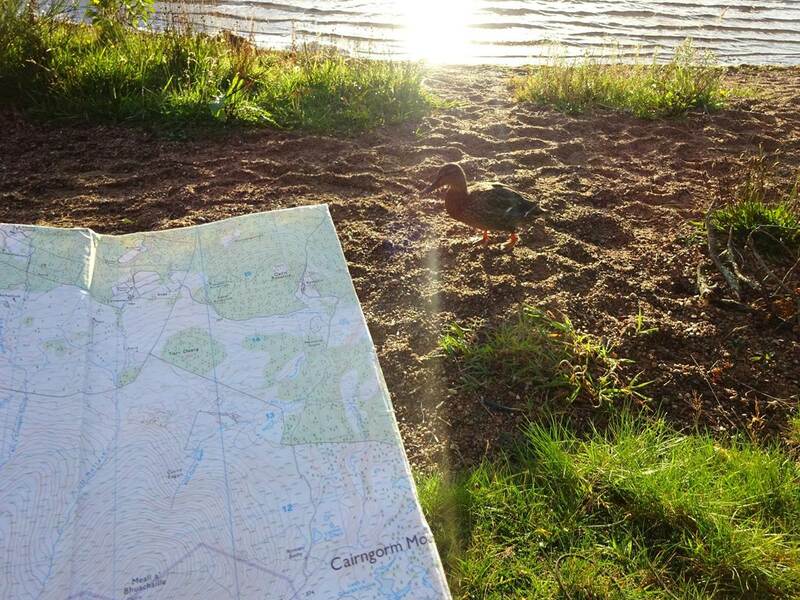 ", "Not as rugged as the Lakes is it?". I thought maybe they were climbers looking for good craggy ascents. 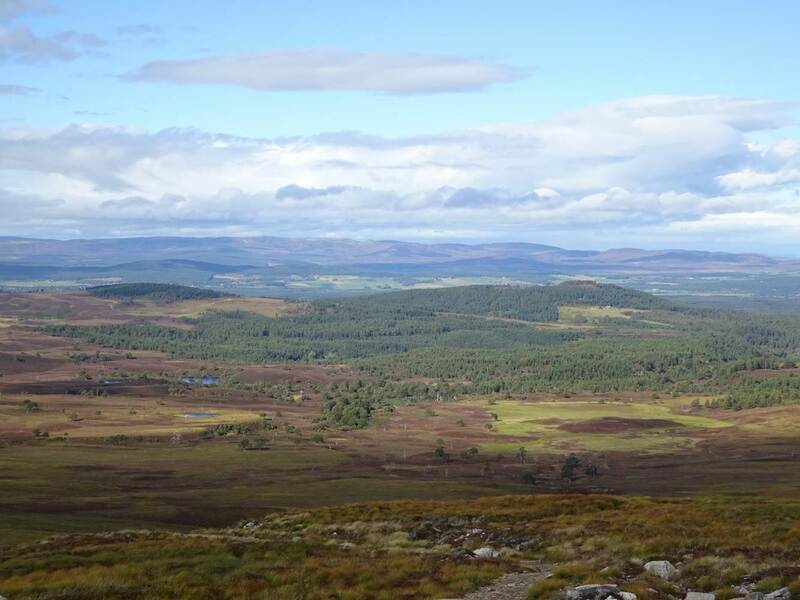 "All we've seen so far is Aviemore and some windmills...". Hard to please some folk! 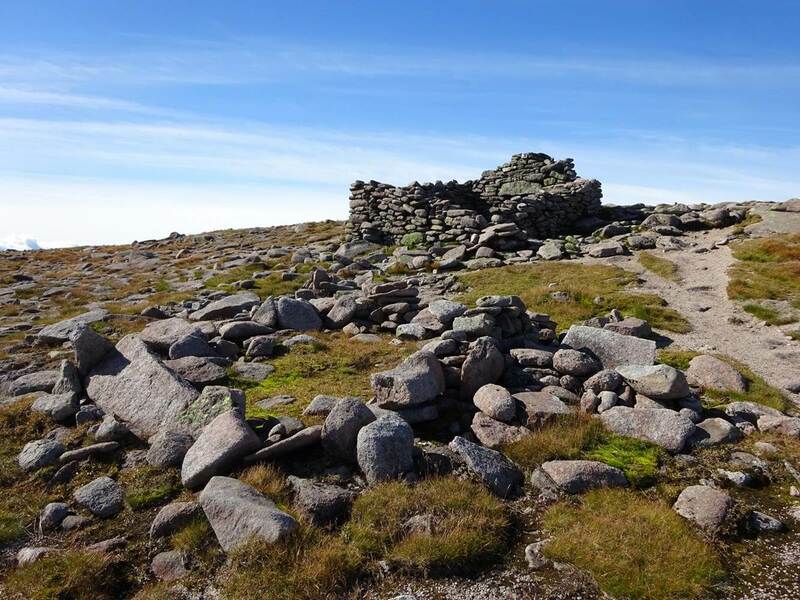 The ruins of the Sappers' Bothy indicated I was nearing the top of Ben Macdui. 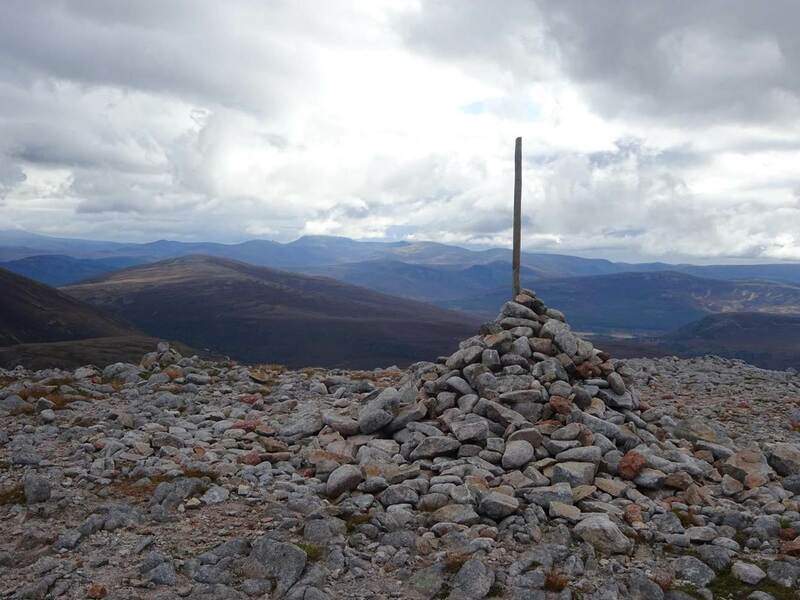 The terrain leveled off towards the top, but was very rocky so I hopped and jumped the rest of the way to trig point. 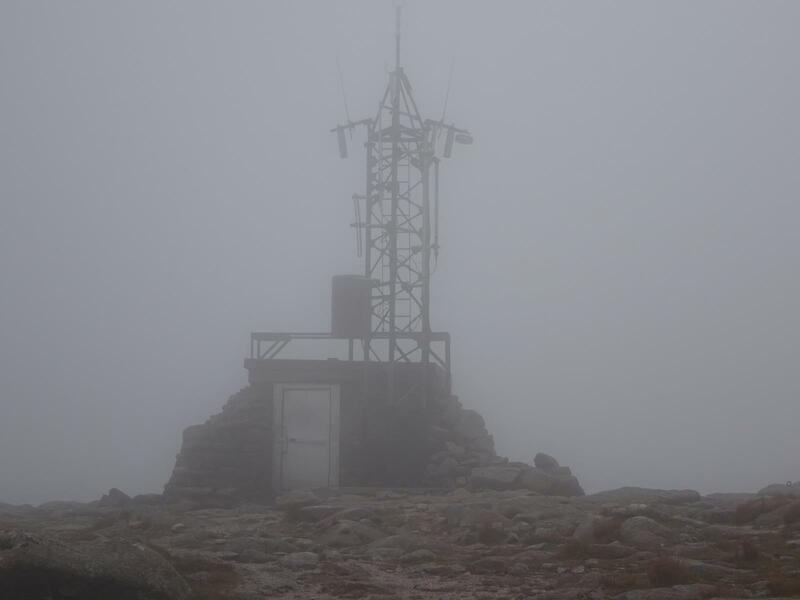 The top of Ben Macdui was chockablock!! Families, ladies' rugby teams, French people - the world and his wife was up here. Up on the large summit cairn as I was coming down two girls came up, and like the two lads earlier had no time to give me the time of day as I stood to one side to let them pass. They went off to find the best spot to catch some rays nattering loudly as they went. After a spot of lunch I headed back down the same way I'd came, Splendid views in every direction! But the two girls from the top had left about the same time as me, and were 20 yards or so behind... and never stopped talking all the way down. Grrrrr. As we headed down my plan was to cut the corner a bit and head towards Derry Cairgorm and left the two girls behind to carry on chattering away amongst themselves. But when I got towards the bottom to join the DC path I saw the two girls now ahead of me! I should've just stayed on the path too. I passed them but just after that they set off again. 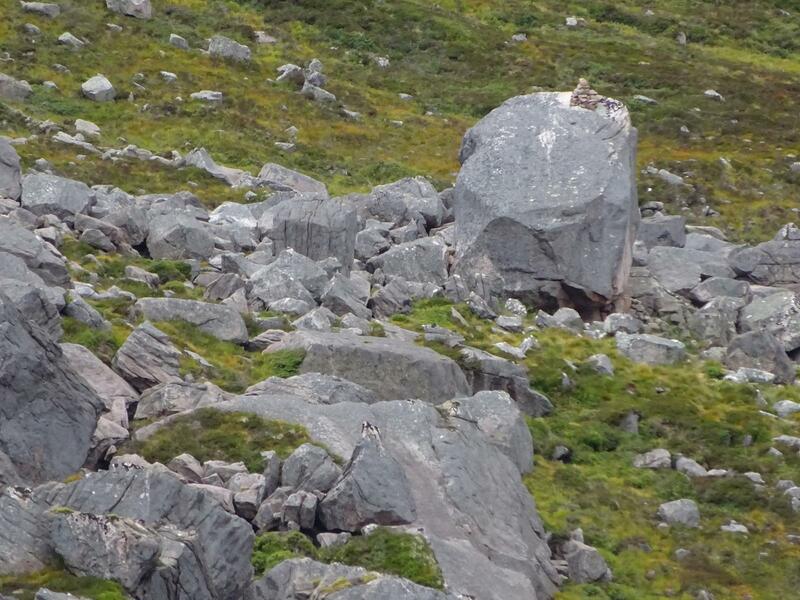 And so once again I had them right behind me all the way up Derry Cairngorm, nattering endlessly and pointlessly. Is it just me being a cantankerous old grump of is that really annoying?? 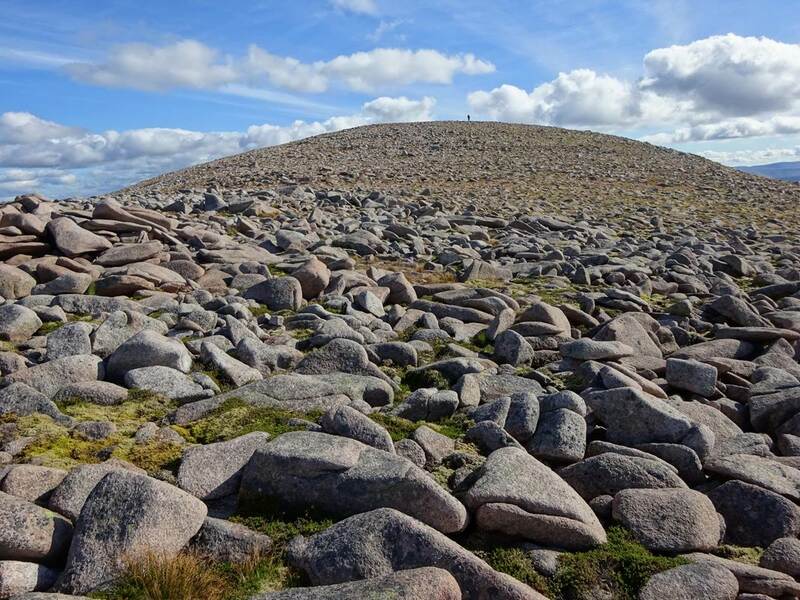 Anyways, lots more boulders to hop, skip and jump across and I got to the first of two cairns. The second one seemed to be the summit, so I had a rest here and made a new friend in the form of a Staffie with a collar saying "Deadly friendly" on it. And so he was! His owner, who was heading off home, on hearing I was camping kindly offered me his rations. A nice pair they were! The chattering girls turned up, so I gave it plenty of time at the top for them to disappear off. 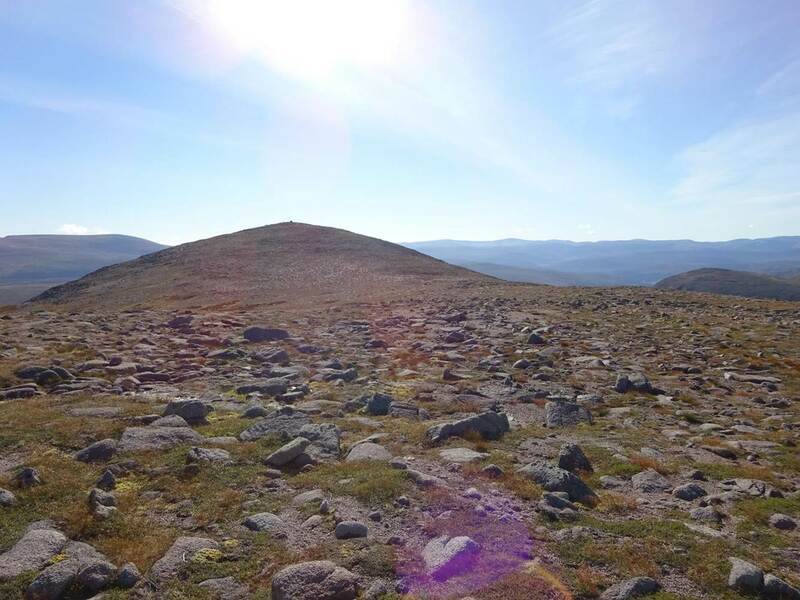 Which wasn't too bad as sitting down out of the breeze the top of Derry Cairngorm is a very nice place to be on a day like this. 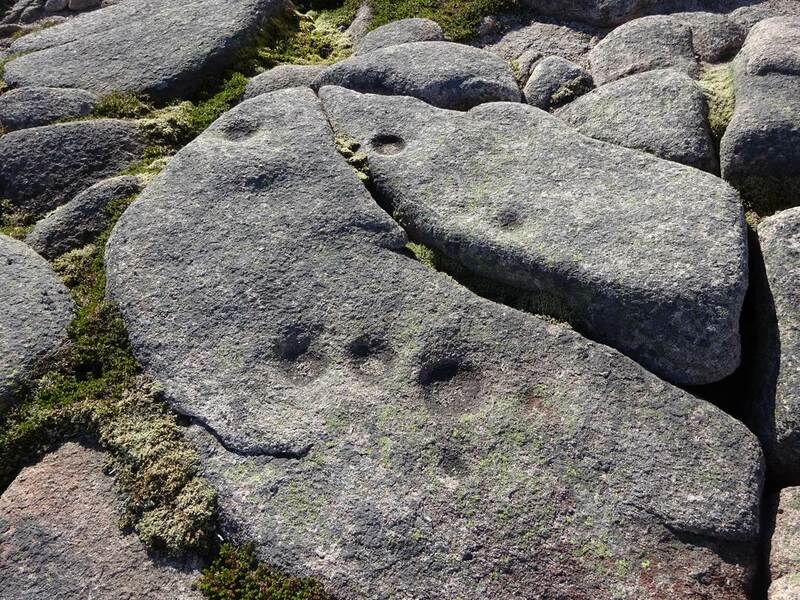 I saw quite a few of these neat round holes in the granite - I wonder how they were formed. Wind and rain I suppose... but how?! As my campsite came back into view I noticed another tent not far from mine. After the initial annoyance of just having a near neighbour I suddenly started worrying that he might have found me lavatory stone, as I hadn't covered the hole up yet! After getting a free dollop of Skin So Soft on the way down I got back to my saggy tent. If anyone is familiar with the Zephyros Wild Country and can help me with my sag, all ideas gratefully received! 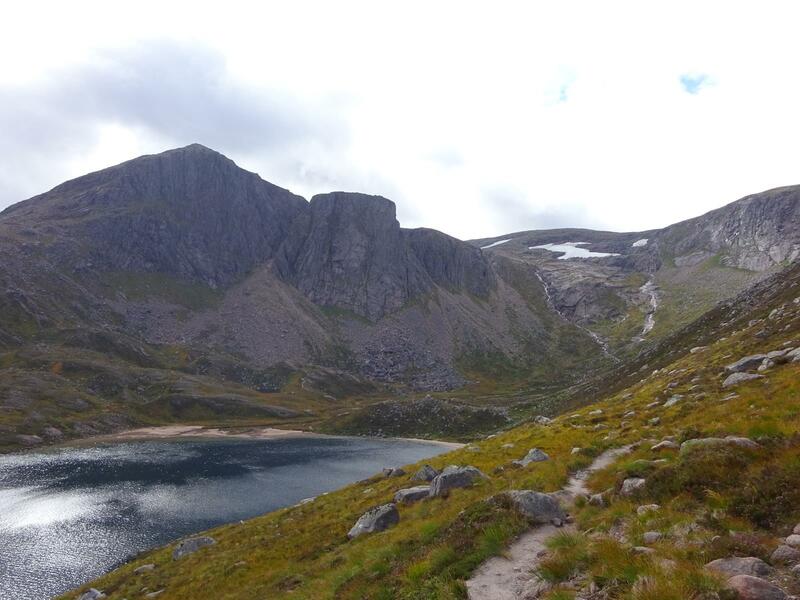 Day 3 - Loch Etchachan to Mar Lodge. 16 miles, 1835ft ascent. Thankfully there was no snoring during the night, not that I heard anyways and that's all that matters. The path was good and dry heading down past the Hutchinson shelter. Looking back up at Stob Coire Etchachan on the left, from where I'd been looking down to here yesterday. 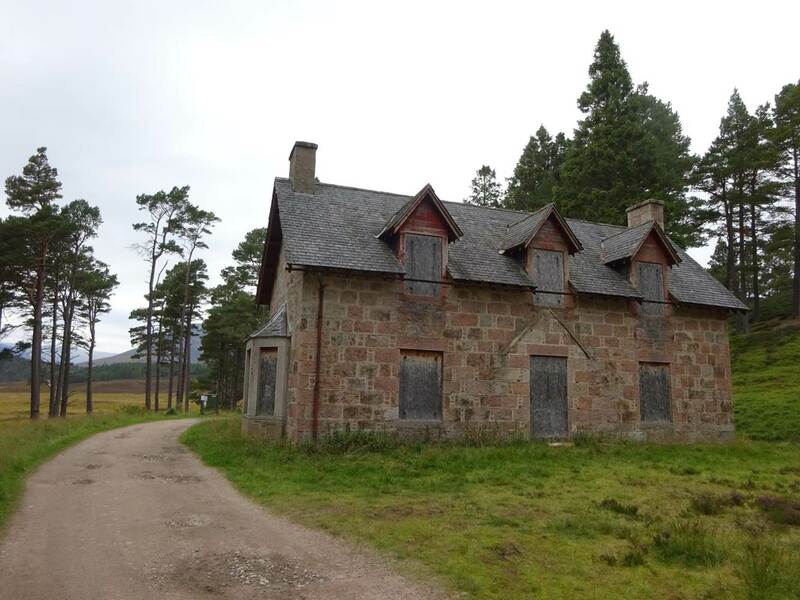 Lunch break at Derry Lodge was not even allowed to begin by the local midges! 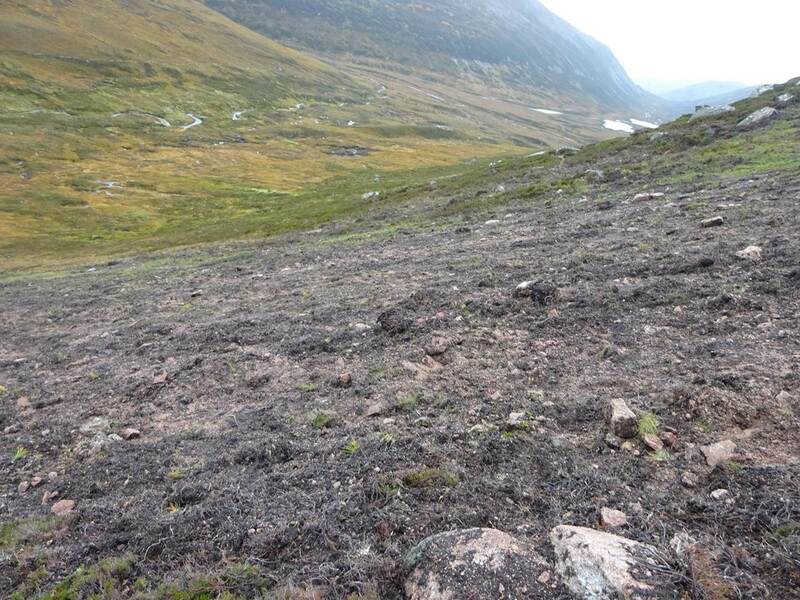 On the other side of Lui Water there was a group of people traversing the lower slopes on Sgor Dubh spaced apart, as if searching for something. They continued for a little while - I wonder what they were looking for? A lost fellow walker? Someone's car-keys? Treasure!? 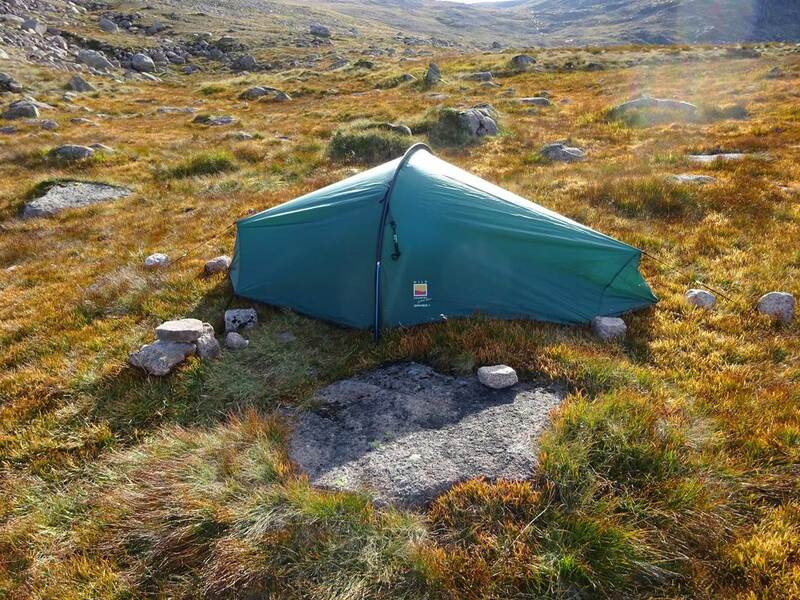 Down in to Doire Bhraghad now and thankfully only a couple of miles to my intended camp site, down near Mar Lodge somewhere. After setting up camp I had plenty of time to head off to the Punch Bowl and the Linn of Quoich a couple of miles away. All very interesting! Although I'm suspect if the clansmen of old had literally used it as a punch bowl they might have wanted a lining. 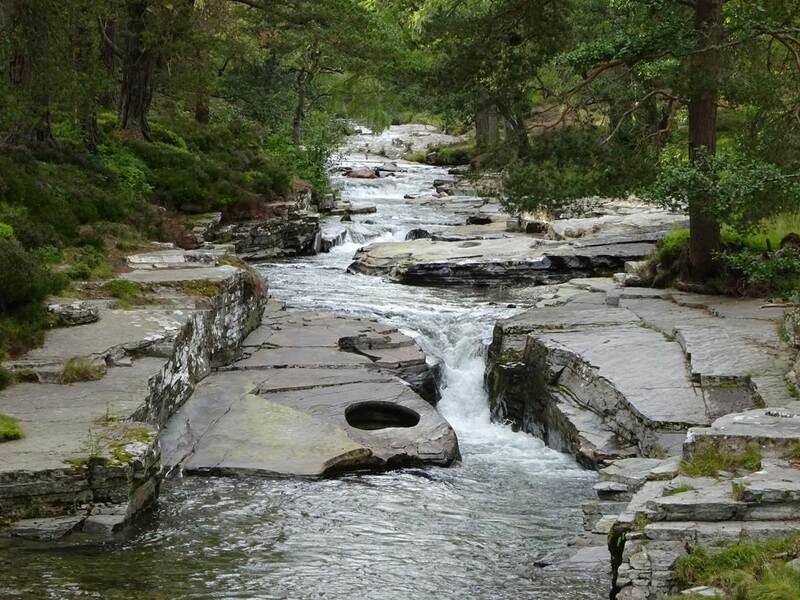 It does make you think how long water has been sloshing over the granite for. 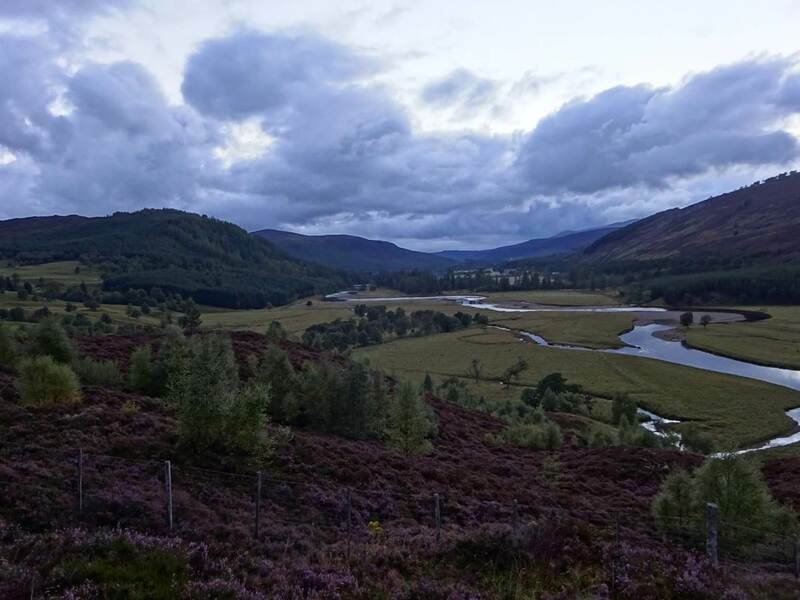 Day 4 - Braemar. 13 miles, 2329ft ascent. Nice easy day today. No mountains, no glens. Not even any very long walks. Just a castle and some household grocery shopping to do. 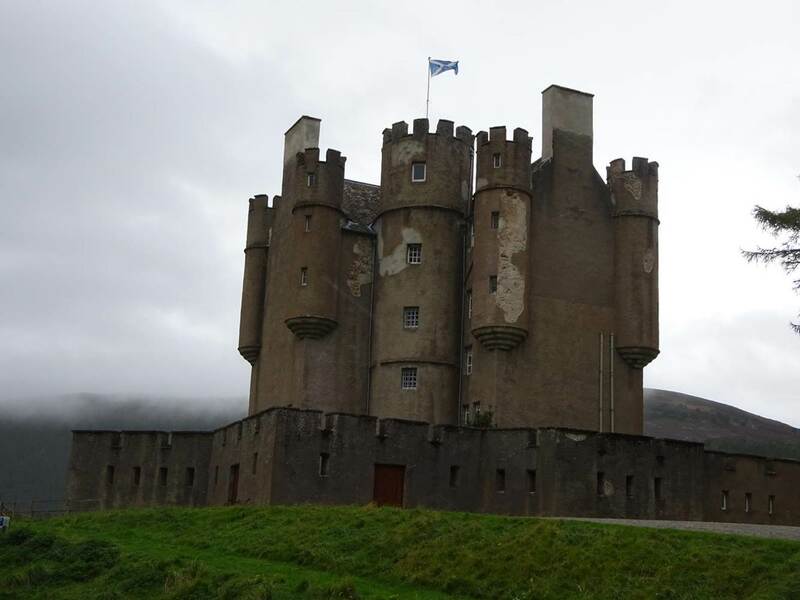 Today was the day of Braemar Castle. The castle was just along the road a bit from the garage where vital meths supplies were obtained. And it was closed. Oh well. We've seen it now, that was the plan. Mission accomplished. Let's head back, via the pub. Full of fish, chips and beer the daylight was fading as I headed back for an early night. The mountains are back tomorrow! 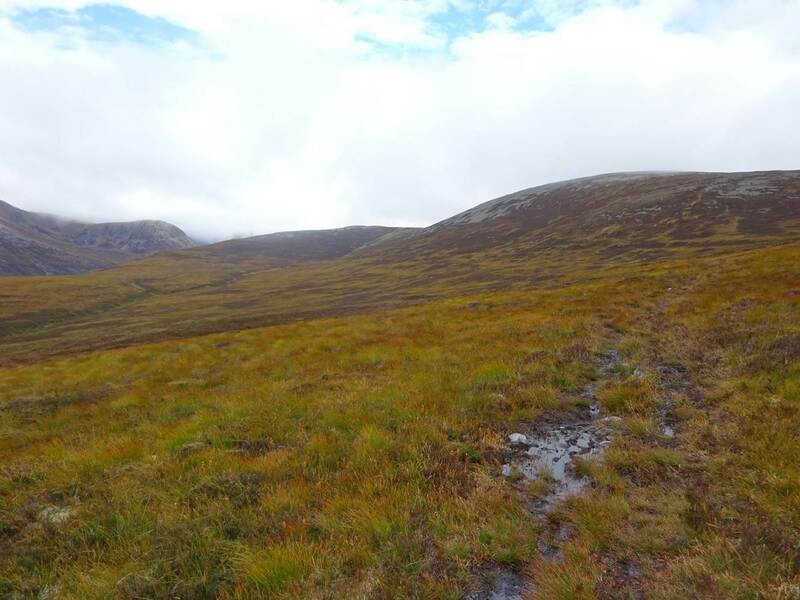 Day 5 - Mar Lodge to Fords of Avon. 16 miles, 3968ft ascent. Slept well, and away on time. Heading back away from civilisation now - I always like to see signs like this. 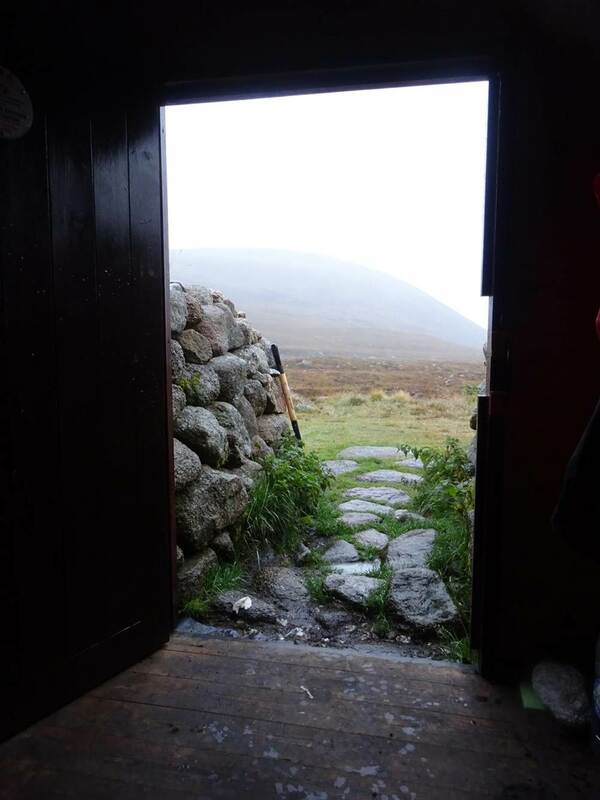 Through Doire Bhraghad and Bob Scot's Bothy, which I'd missed on the way in. As we plodded up the other side of the Derry Burn than we'd come down I took what looked to be path in what seemed to be the right place. This 'path' soon disappeared though - as is often the way, and I was just following NE / N bearing as it was too steep and tedious and overgrown to look up. I was so glad to leave the trees behind. Even if then it got very boggy but I'm not sure if the bogginess was actually a path of sorts - it's often hard to tell. 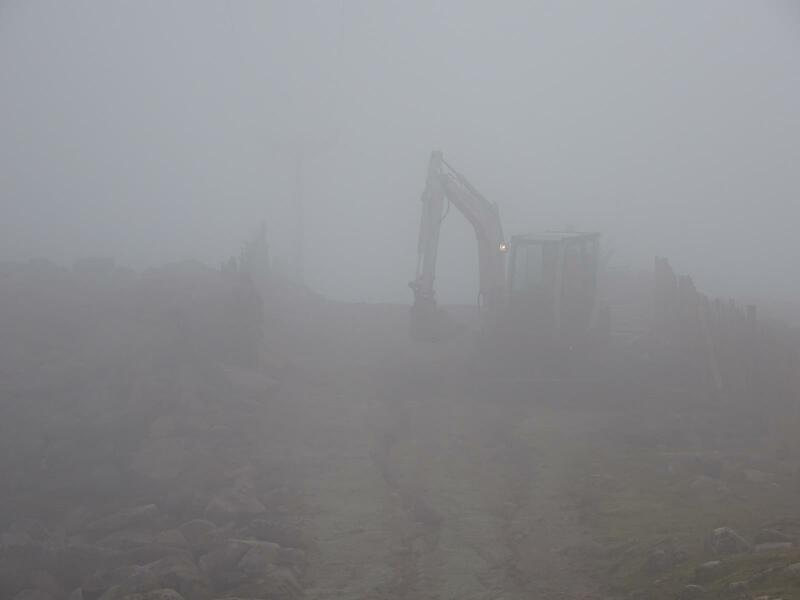 After a while the wind had picked up and the terrain levelled off. Head down I tramped on. 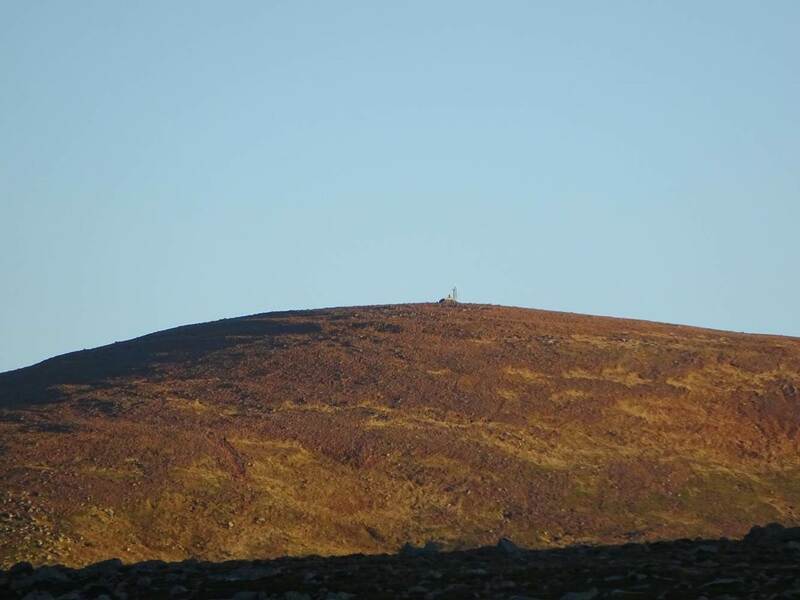 I happened to look up and noticed that I'd almost walked straight past Beinn Bhreac, its be-staked cairn just a few hundred yards away to my right. I gleefully scampered over. It was very very windy - the flag must've blown away. 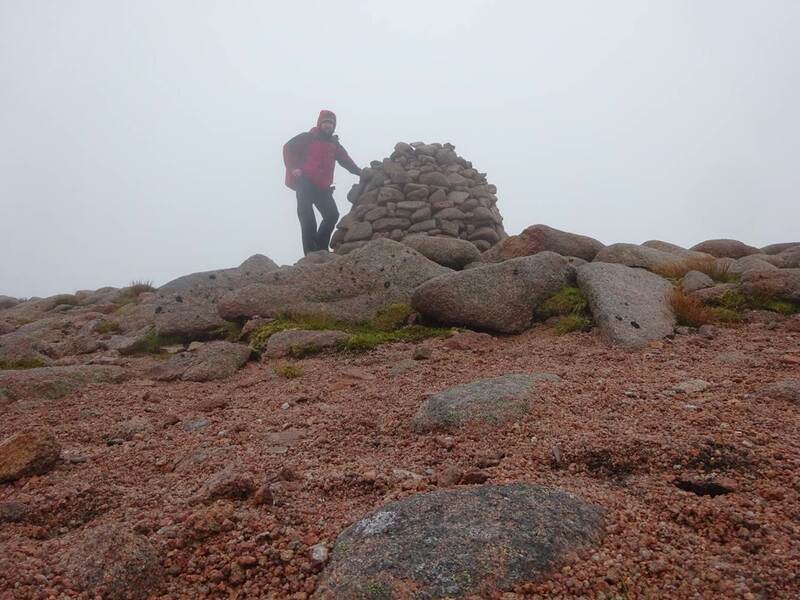 The next peak was Beinn a' Chaorainn postponed from a couple of days ago. 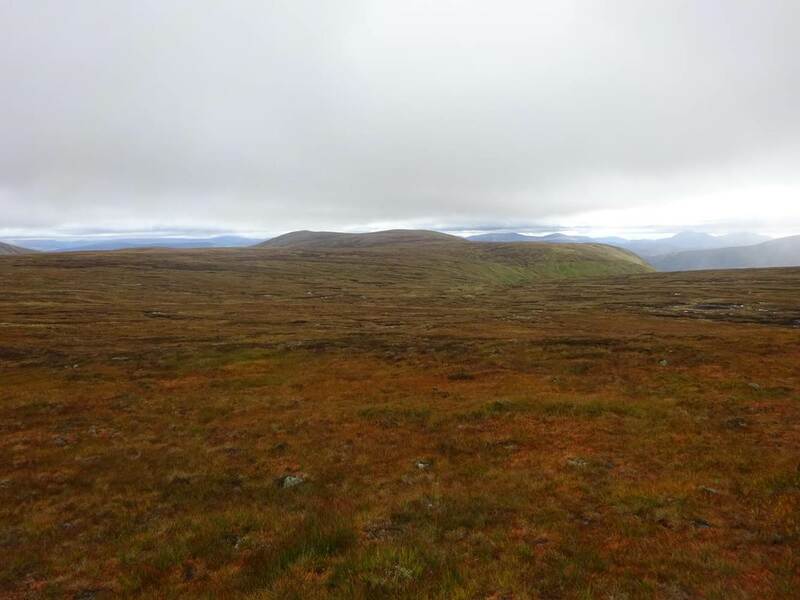 It was just about 3 miles away across pretty flat looking ground, and only a couple of hundred of feet ascent. Peak to peak it looked like one of the easiest Munro-Munro passages going! But oh boy, was I wrong! 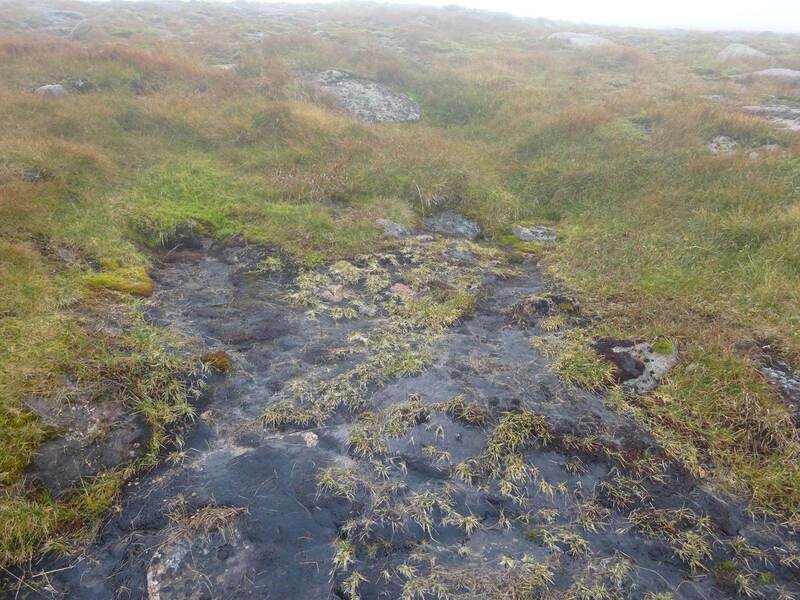 In my excitement I'd forgotten that flat grassy land high up generally means one thing - bog. And it was very very boggy. Not just boggy but very uneven with huge areas totally waterlogged. I had to consider every footstep and often had to double back and walk around an expanse of dark forboding looking gloopy water. On top of that the rain / mizzle was coming down very heavily. Although when I say coming down I mean it was coming across. One side of me was dripping went, the other quite dry. This three mile section took an unbelievable three hours. You work out the average speed! Finally at the top of Beinn a' Chaorainn, time for a brief selfie and straight back down. Too wet & windy and too fed up for a rest! Looking back over Lairig an Laoigh from the opposite side from a couple of days ago, now I could see that there probably was a way down. But with hindsight I think that I'd done it the right way, even if I'd only been about a third of a mile away as the crow files. Down in the steep-sided glen of the Allt an t-Seallaidh the weather and the ground both got wetter and wetter. But slowly the Fords of Avon shelter came into view, and given the conditions I was sure I wouldn't be the first there but would there be any room at all? 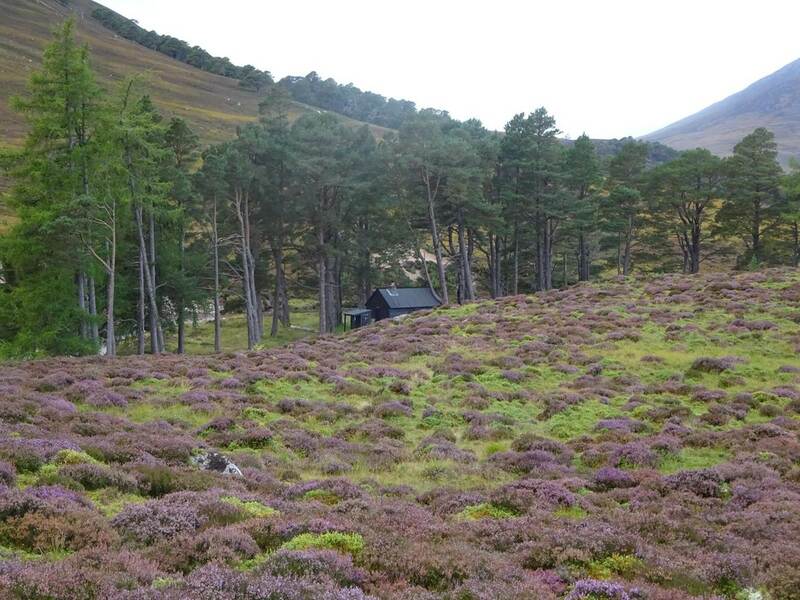 Or would it be like the Hutchinson shelter as the chap on Derry Cairngorm was telling me? Also, the funny thing about the Fords of Avon shelter is that the nearer you get to it, the smaller it becomes! And anyways, before we should be worrying about the availability inside the shelter we really had to worry about the Fords of Avon itself - I already decided that I really did not want to take my boots off. After much thought (probably not that much to be honest...) I managed to scamper across it all no bother. And added to the relief of the successful crossing I found I had the shelter to myself. Camping wouldn't have been that much of a problem but I was dripping wet and it's a great convenience to be able to hang up wet things over night. No-one else came to disturb my little dry shed of tranquility and a smashing night's kip was had. 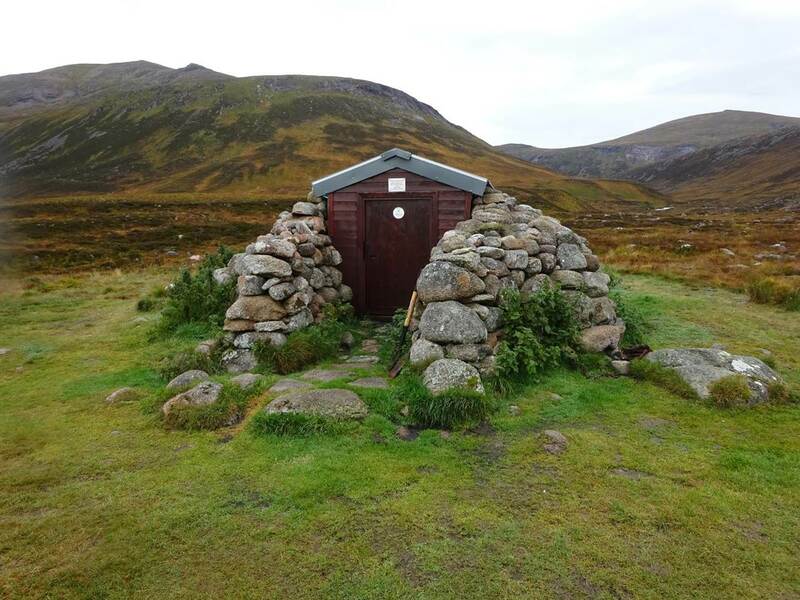 The joy of bothies! 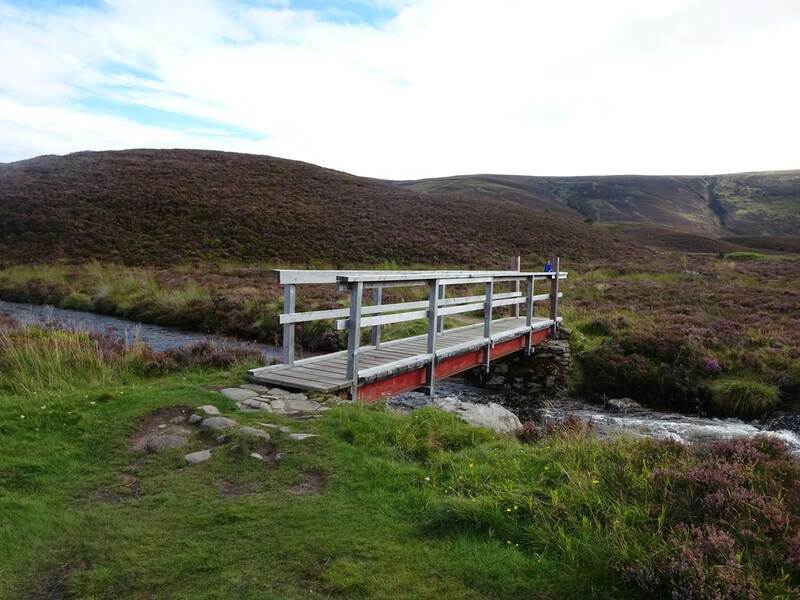 Day 6 - Fords of Avon to Glenmore. 14 miles, 2865ft ascent. 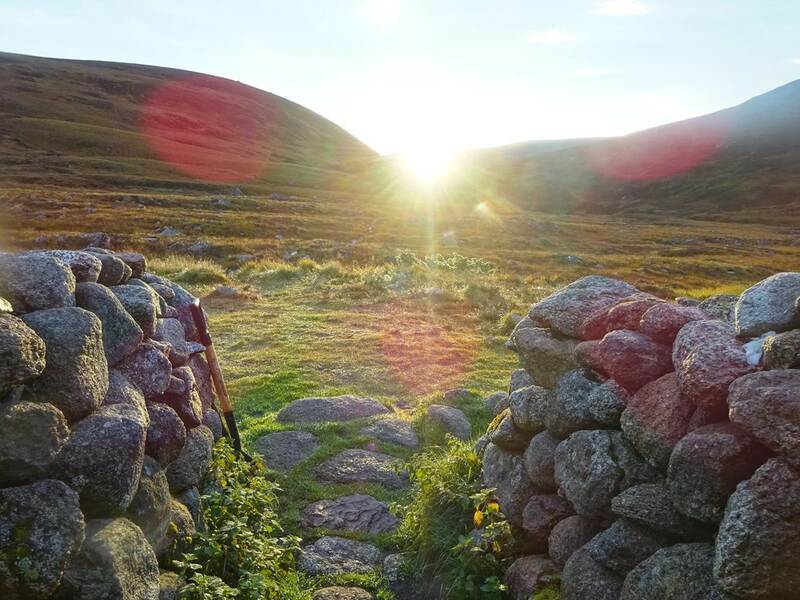 A lovely morning started off with the sunrise shining straight into the door of the shelter, all ready for the last Munro of the trip - Bynack More. I was so pleased to the Fords of Avon shelter last night, I was a little sorry to say goodbye. I decided to go up and along the side of Leachid a' Bhainnie and this was pretty awkward, ankles not being designed to walk along inclines. The couple of landslides didn't help either. 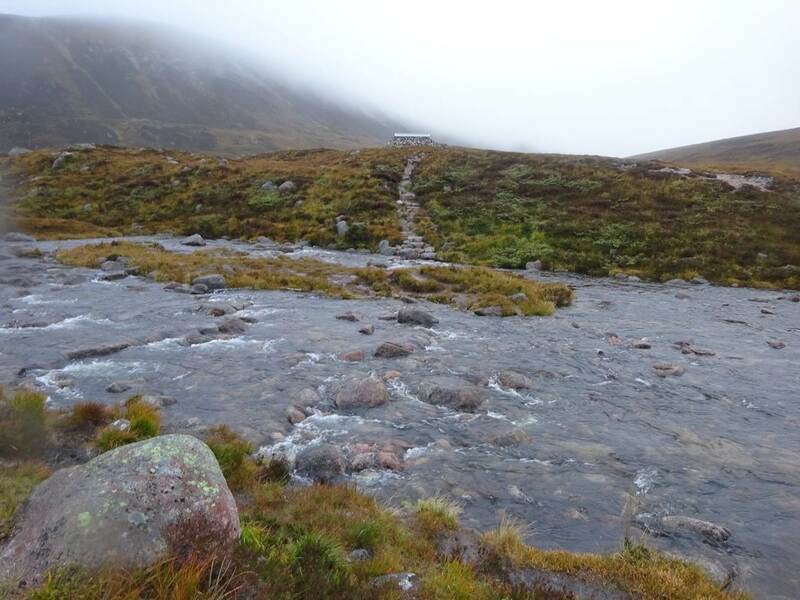 The the Allt Dearg provided a slight obstacle too. It was very windy again today. The photos make it look so still. 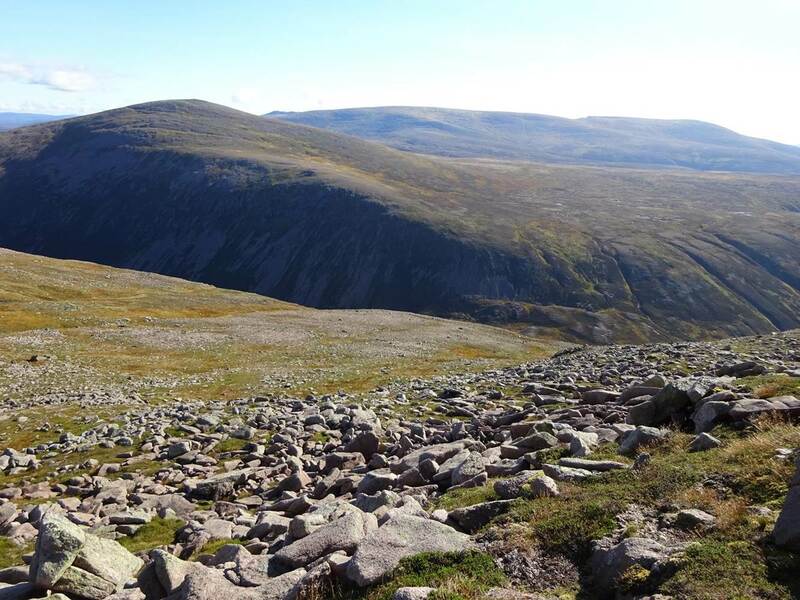 After just a couple of hours of slog we were up high, the summit already visible in the distance. Past the Barns of Bynack. 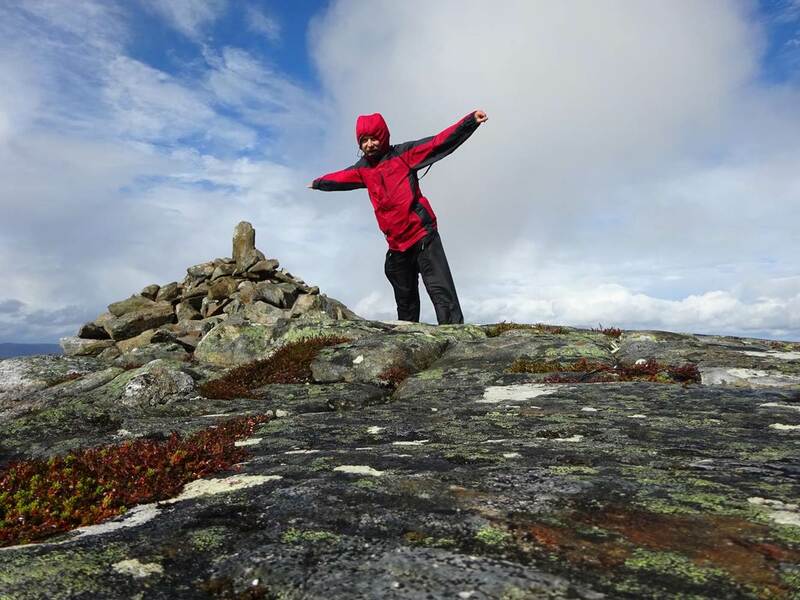 Very windy but Bynack More wasn't too much trouble. 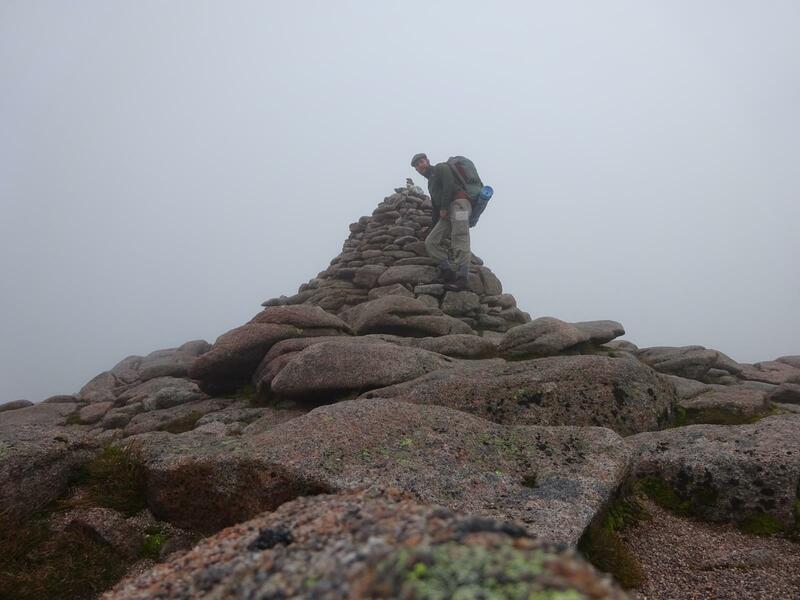 My 17th Munro! The views were impressive from the top especially as the clouds were blown away as quickly as they came back in again. I could also see some signs of humanity again - some small settlements although I'm totally sure what - far away down below as a pointer of what was sadly soon to come. Looking west from Bynack More. Mission accomplished now and with the weather looking lovely I wasn't really paying attention as I headed off the wrong way towards Bynack Beg, but I had plenty of time and wasn't far away from the path I wanted so was in no rush so found a comfy seat in the rocks and enjoyed the view. I headed slightly back across myself to skirt round a valley to get on the main path back down. 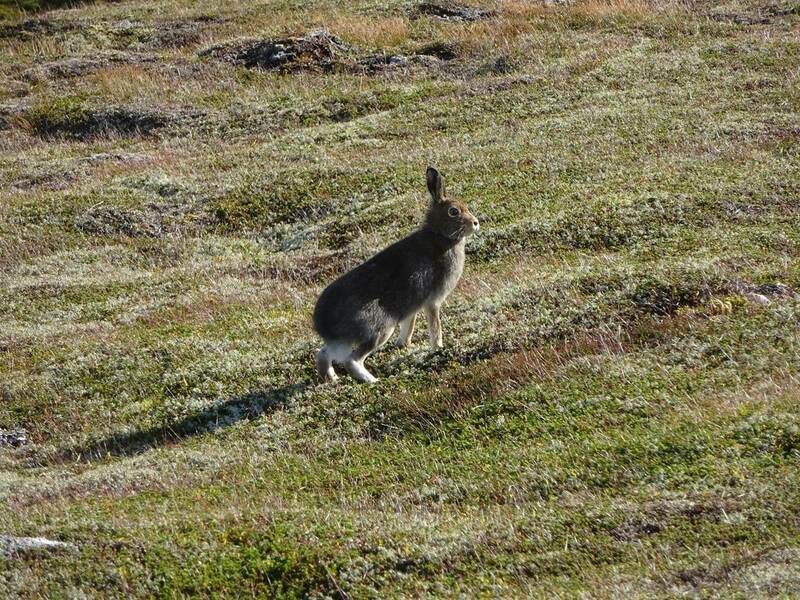 Past a mountain hare - I hope he didn't mind me gate crashing his mountain. The strange formations underneath the Sron a' Cha-no (I think) on the other side of the Strath Nethy looked like some remnants of a mysterious ong-lost civilisation. But they probably aren't. Dropping down the weather got warmer and views tamer, although still very nice. Looking back the glen of the Nethy, and that bridge that everyone seems to take a photo of. A knowledgable chap here told me "That's the Barns of Bynack of over there... " he said, pointing at the Ryvoan Bothy. Thanks Mister! 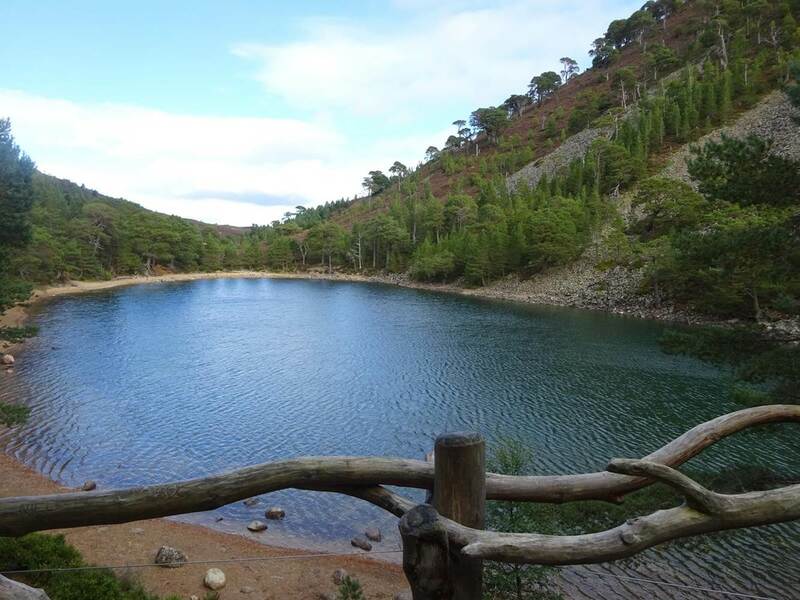 A breif rest at An Lochan Uaine. 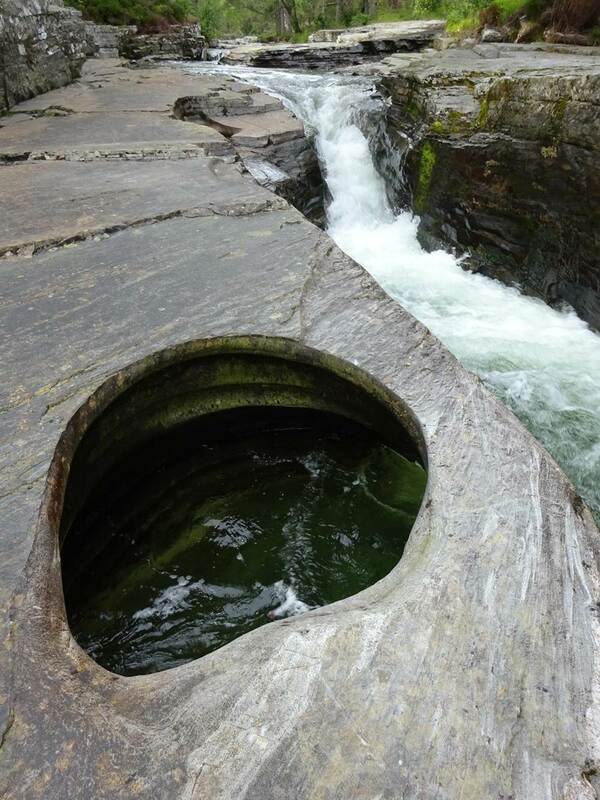 It is green because of the fairies washing their clothes in there. 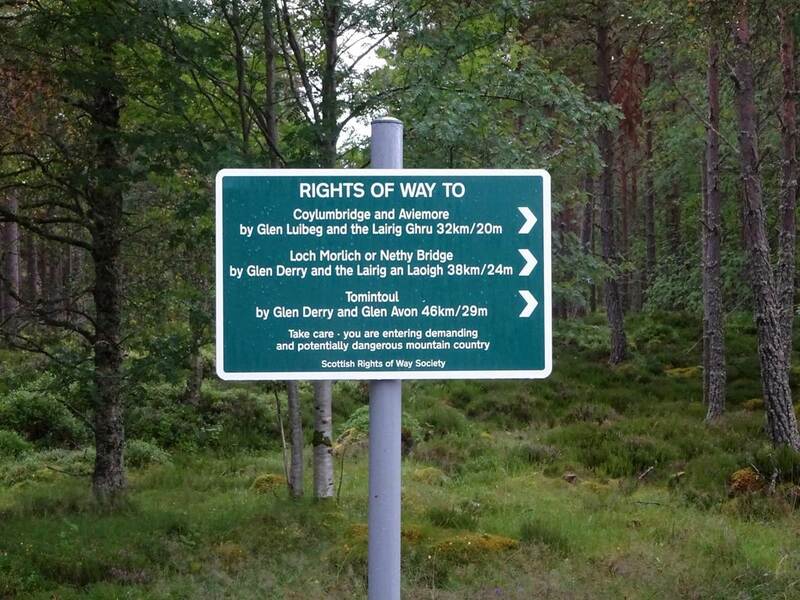 I didn't see any today, but that came straight from the mouth of the Glenmore park ranger, so there. 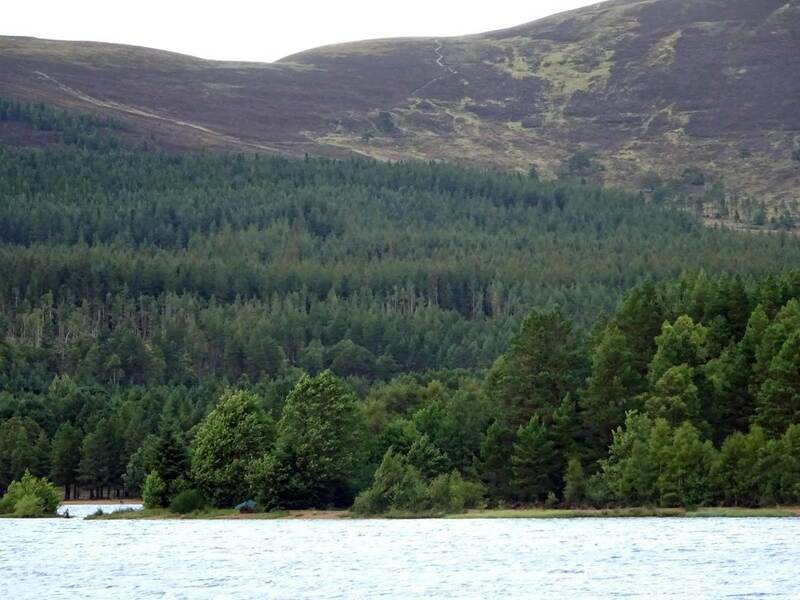 After a wander around the woods by the shores of Loch Morlich I found a nice little spot to camp. I settled down in the warmth of the setting sun with a visitor. 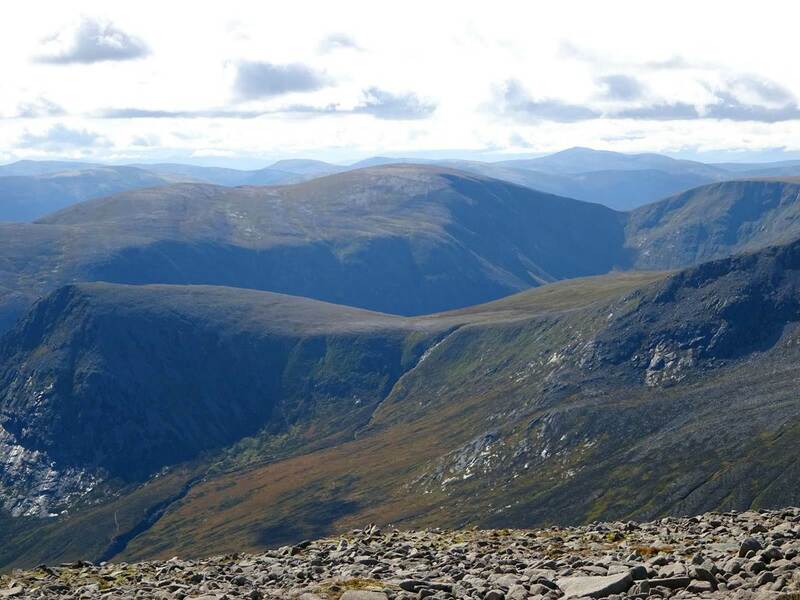 My Cairngorm Circular was at an end - but my trip wasn't. I'd allowed a couple of extra days in case of emergencies, navigational errors (Who Sir? Me Sir?!) or changes of plan, and in fact I'd got back a day early so now had three or four extra days to kill. 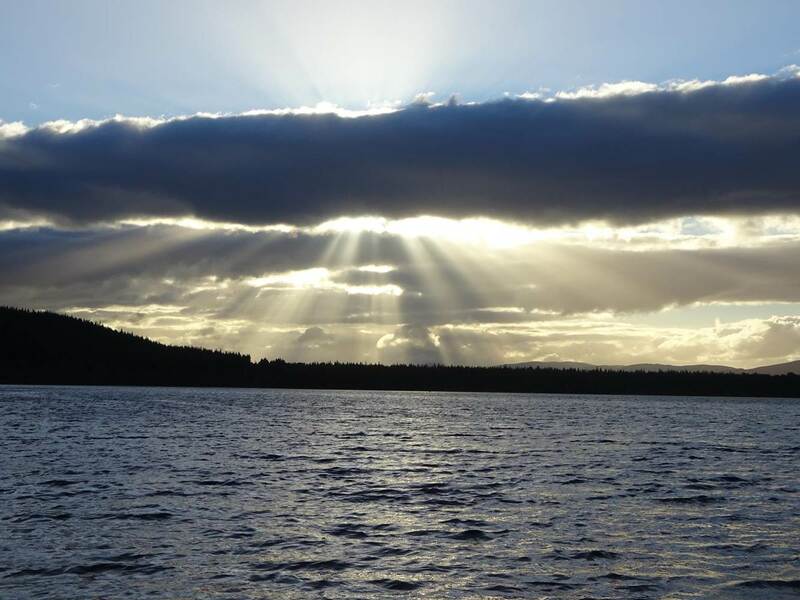 A nice problem to have as I consulted the maps for inspiration and listened to the gentle lapping of the waves and the distant-but-raucous party from the boat club on the other side of the loch. Day 7 - Post-circular extras 1. 10 miles, 3377ft ascent. 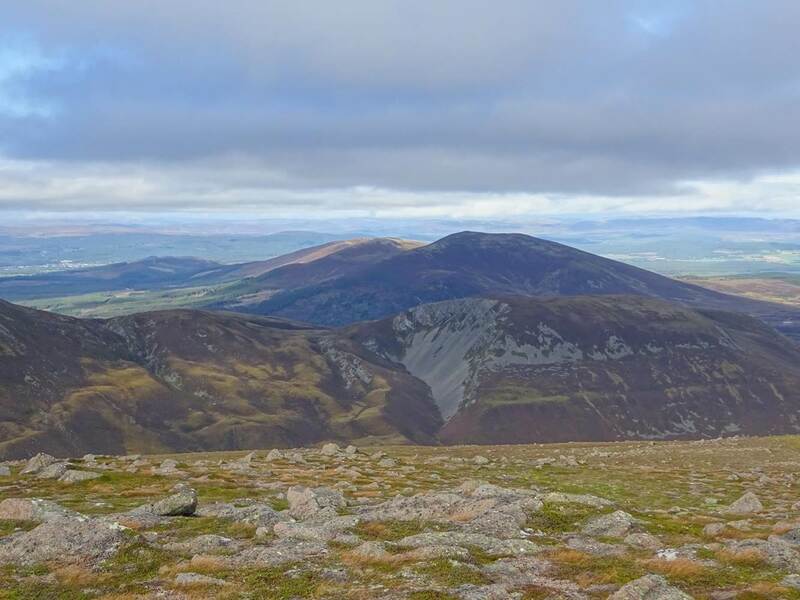 Today the peaks of Meall a' Bhuachaille, Creagan Gorm and Craiggowrie looked like a nice ridge walk, just to the north of the Loch Morlich. I packed up and left my gear at the Glenmore visitor centre, taking a view essentials with me in a day-pack, including my jelly babies. "Sorry!" I said to the staff at the centre, as they showed me where I could stash my bag, "...these are coming with me!". We chuckled. 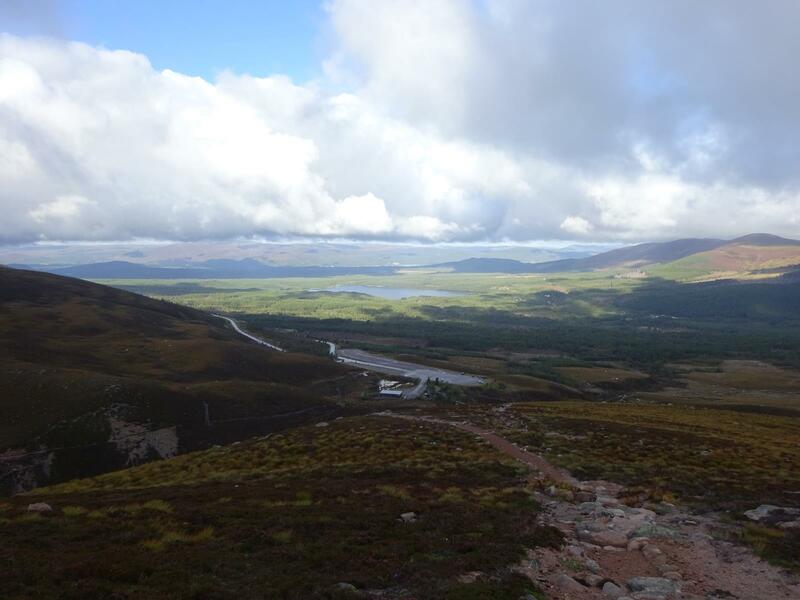 The view from Meall a' Bhuachaille, Loch Morlich far below. 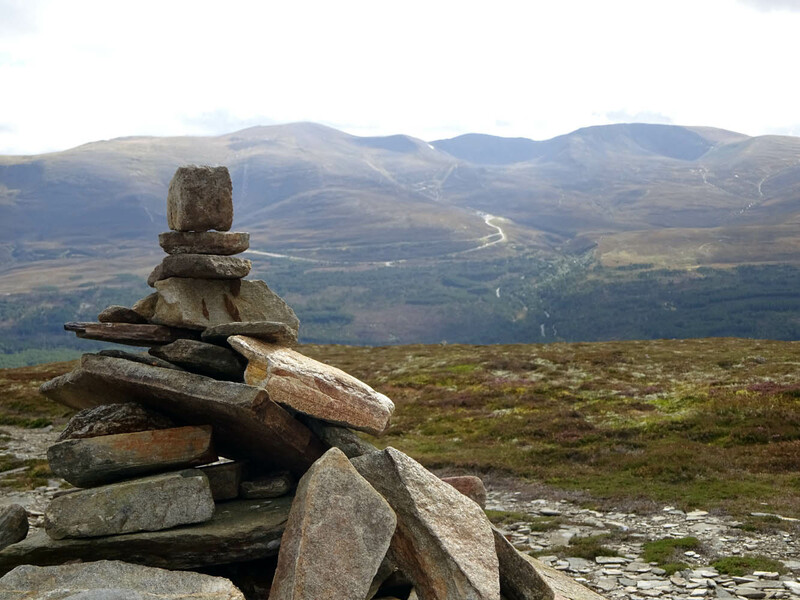 The walk up to Meall a' Bhuachaille was straight-forward but steep, and once out of the woods got very blustery indeed. 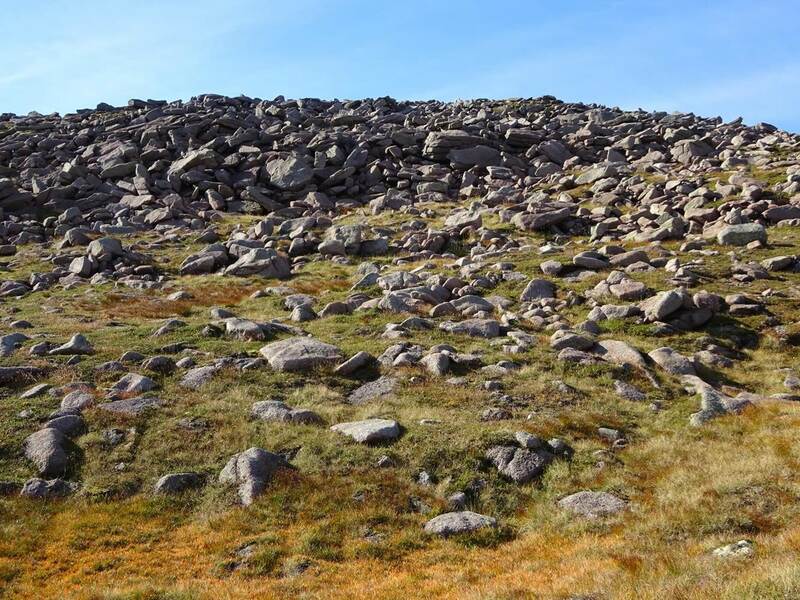 The thick stone walls surrounding the cairn at the top were a welcome shelter. Time for some jelly babies... only they weren't in my bag!! They'd gone. I must have dropped them. 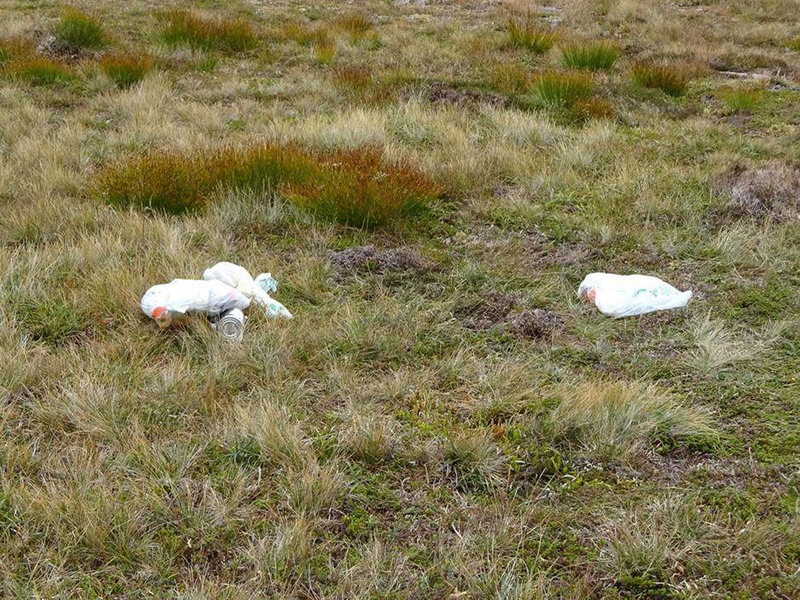 Oh the shame of such wanton littering in such an unspoilt landscape. I wasn't chuckling now. Oh well, I'd be sure to see them on the way I suppose. 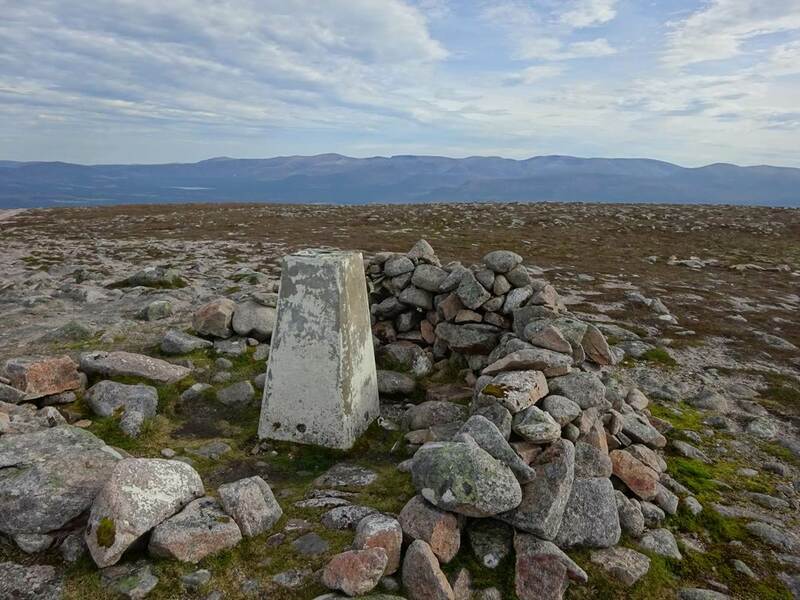 The photos above are the misleading but windy non-summit cairn between Creagan Gorm and Craiggowrie and on the cairn on Creagan Gorm. 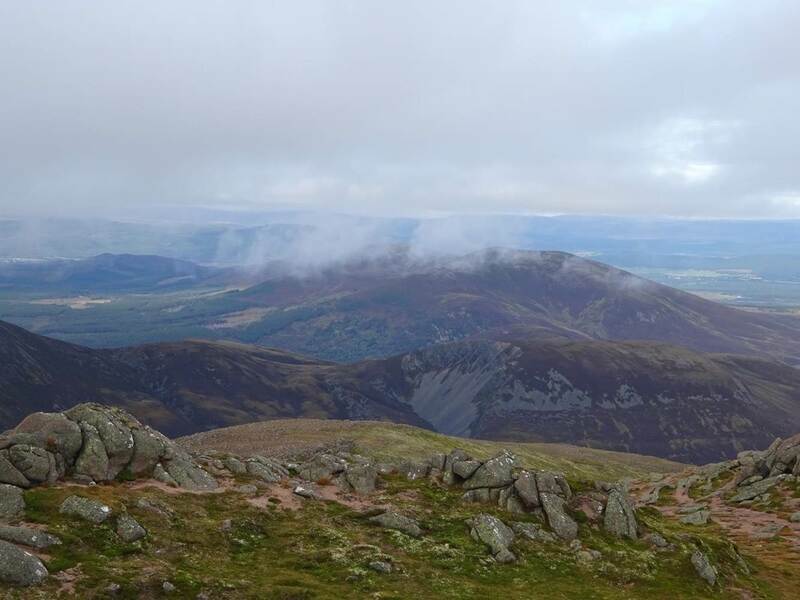 The rest of ridge walk was great and at Craiggowrie I could carry on and descend and loop back or turn around and go back the way I came. I chose the latter option. Back at the visitor centre guess what was waiting for me on the reception desk? Yup, my jelly babies! We all chuckled even more and I munched my way through most of them watching the red squirrels. 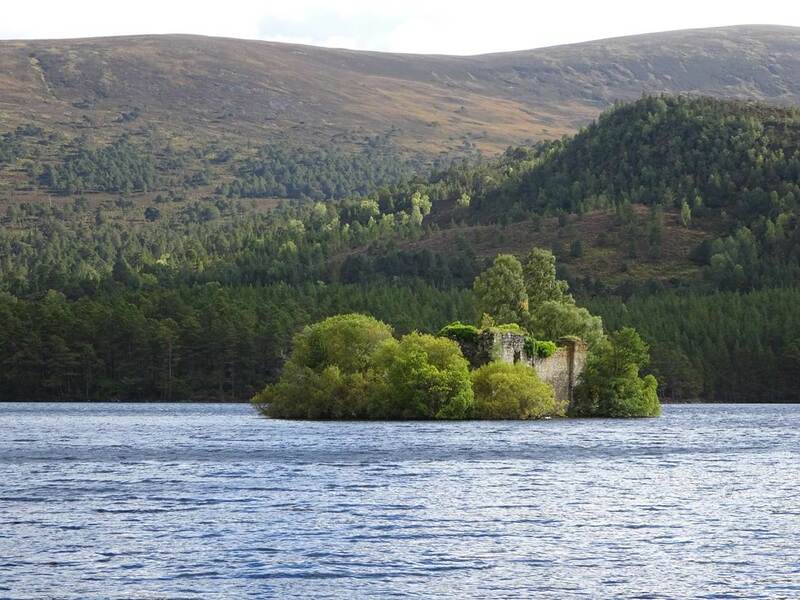 The next day's distraction was a walk down to Loch an Eileen and it's water-bound castle. All very interesting. Day 9 - Post-circular extras 2. 15 miles, 3855ft ascent. Time for last walk in the hills. 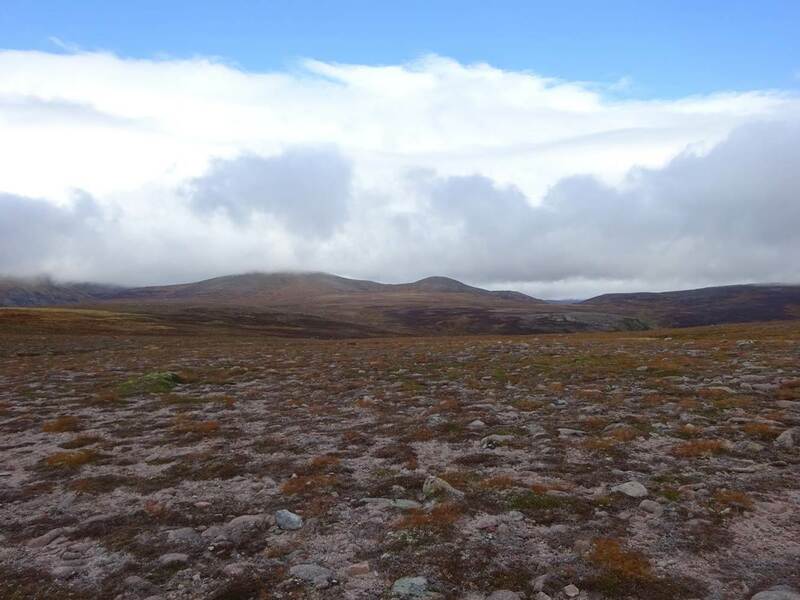 This time quickly taking in Geal Charn Mor. It ended up being a 15 mile circular. 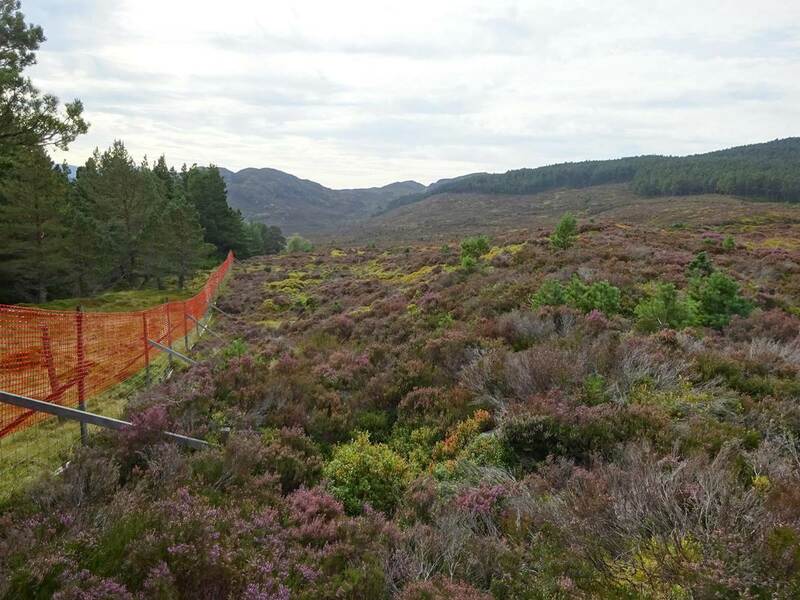 After some navigational problems - forest tracks abruptly ending and gun shots coming from ahead - I ended up having to wade along this fence line through the heather and gorse for quite some while, before finding a track again on the exposed moor-tops. 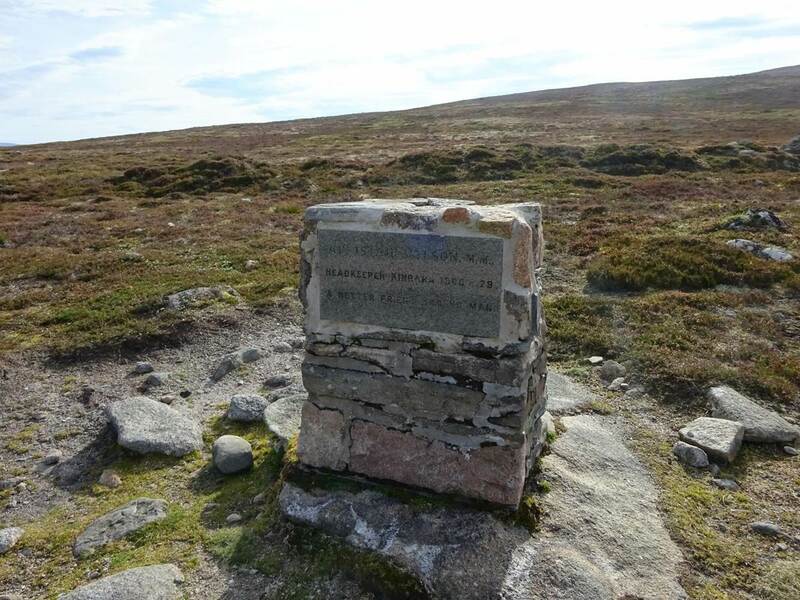 On the way up to Carn Dearg Mor top, and a memorial stone for Alistair Polson the estate gamekeeper back in the day. Geal Charn Mor. All downhill from here. Start of the long journey home now. 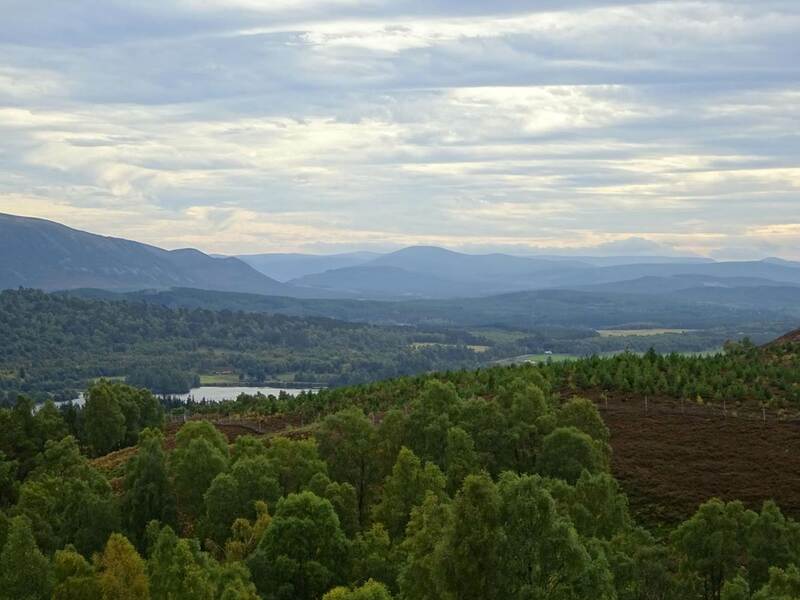 My last view of the Highlands as I drop down in to Aviemore. See you again soon Highlands! Last edited by Old Bill on Sat Feb 13, 2016 6:44 pm, edited 5 times in total. Thanks! It's nice to have to so many great spots so close together! Enjoyed reading that especially as I've been to all those places - but not (as someone else said) all in one go! 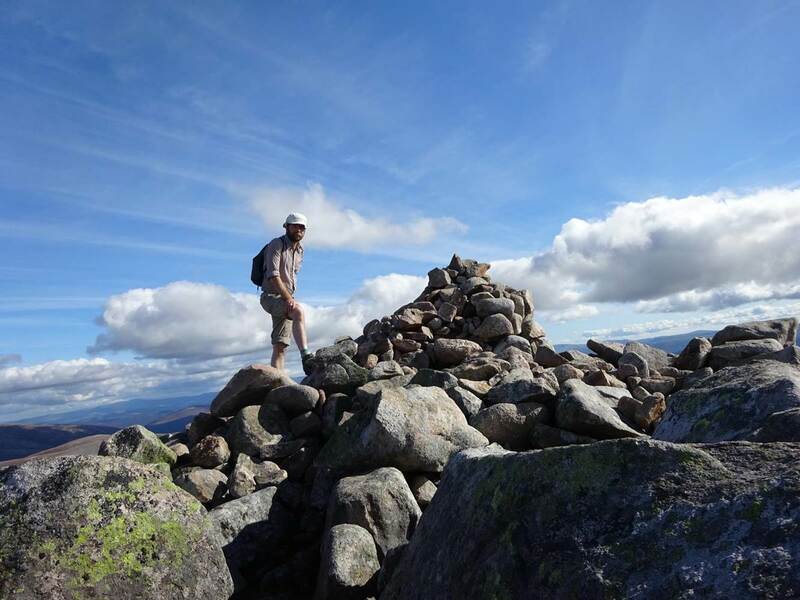 The next time you have extra days left, do the Cairn Toul - Braeriach Traverse! 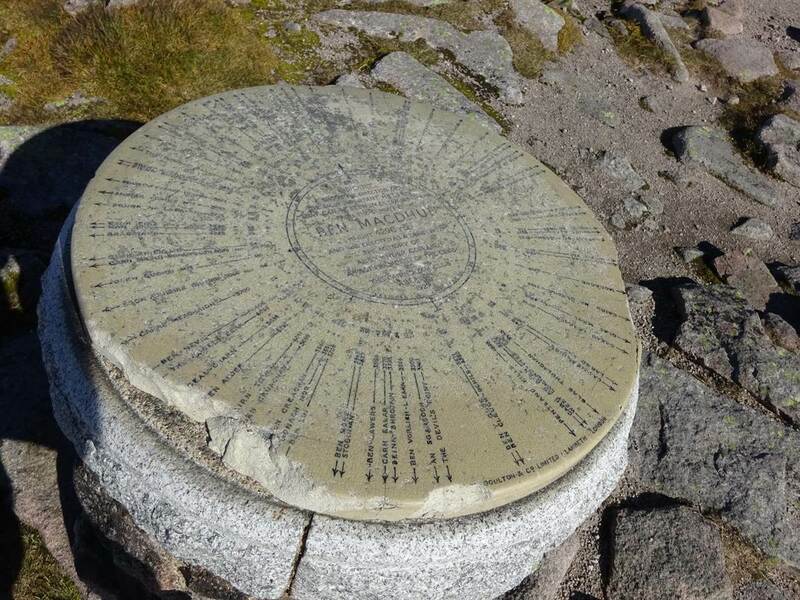 I still have to do it myself but I climbed Braeriach and I recommend this munro to everybody! dogplodder wrote: Enjoyed reading that especially as I've been to all those places - but not (as someone else said) all in one go! Thanks Dogplodder. 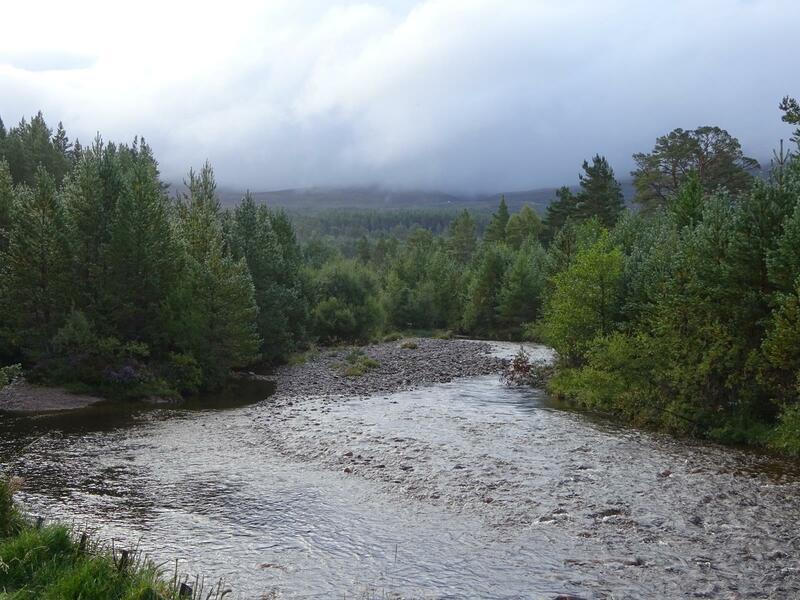 But that's one of the beauties of the Cairngorms - so much is so conveniently close together. Very handy when you live far away and don't have a car. And of course the 1000ft head start is nice too! How did you manage energy wise? You would need a few sandwiches to cover that trip? I don't like back to back days anymore. Knocks my stamina. But then again I'm older than you judging by your selfies! Thanks Brocoli - who couldn't fall in love with the Gorms?! 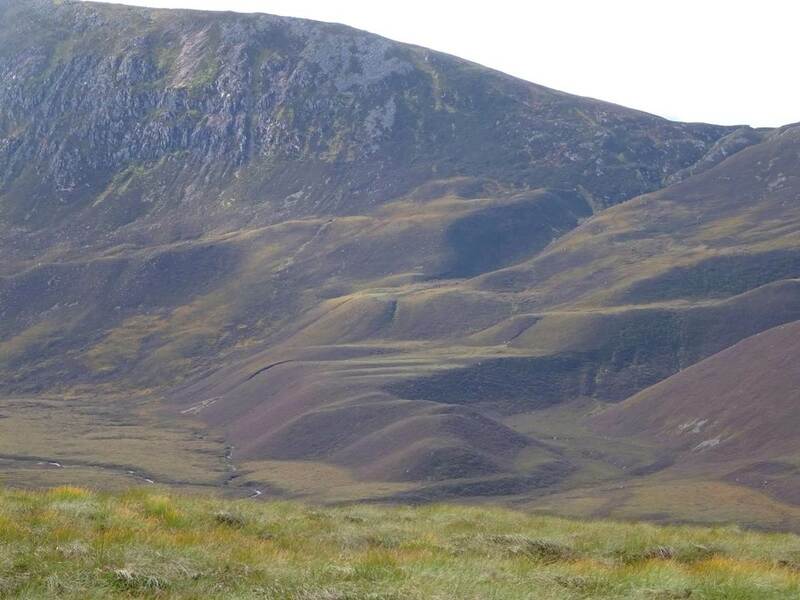 Cairn Toul would've been much for my spare days on this occasion, mainly because I'd run out of food! But I'm planning that very trip later in the year, coming in from the west. I just hope I get as good weather as I've seen on the TRs here. Fingers crossed! Thanks Ally You're as old as you feel, they say. I feel pretty old! Yup, plenty of sandwiches. And jelly babies. And porridge and pasta too. Doing the back to back days is ok really. 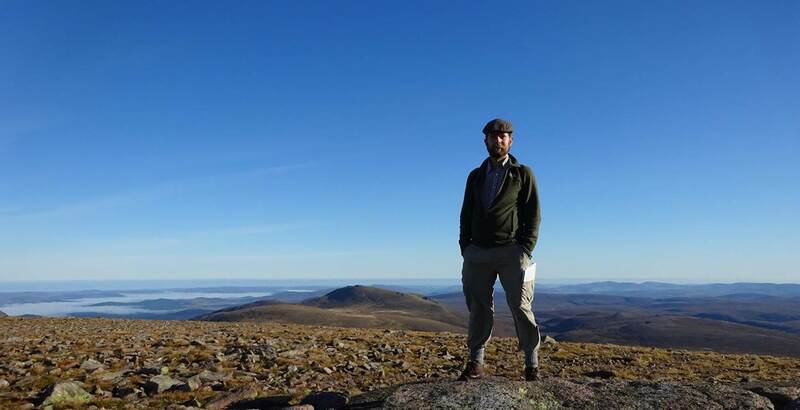 The only real slogs were Cairn Gorm and Beinn a'Chaorainn / Beinn Bhreac - mainly because I had my pack with me then. It makes such a difference. 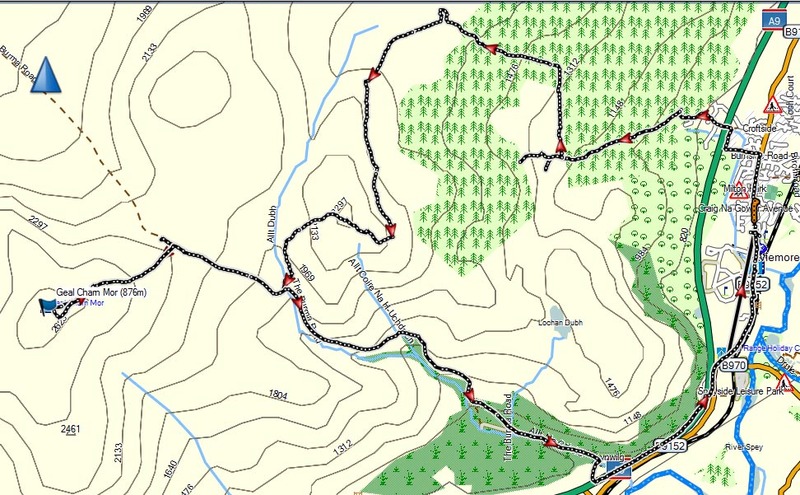 Next trip I hope to set up a base camp and plan the walks from there. I saw this in the paper this morning, and know exactly what they mean! Well, let's wait and see how the weather is and how my legs fair! Quite agree about seeing things from different angles. Gives you a much better feel for the landscape. And the size of it! It all sounds great! 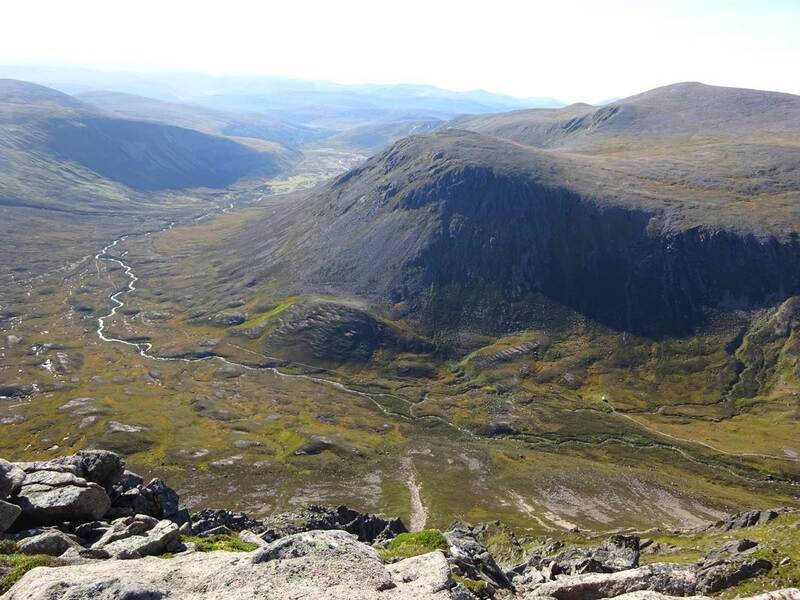 My plan is to do Sgor Gaoith and Mullach Clach a Blair, as well as Monadh Mor and Beinn Bhrotain. All being well I'll have that area ticked off Munro wise then, apart from Carn a Mhaim... although that's still a possibility, just!